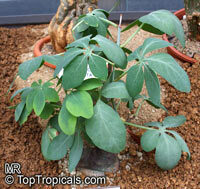 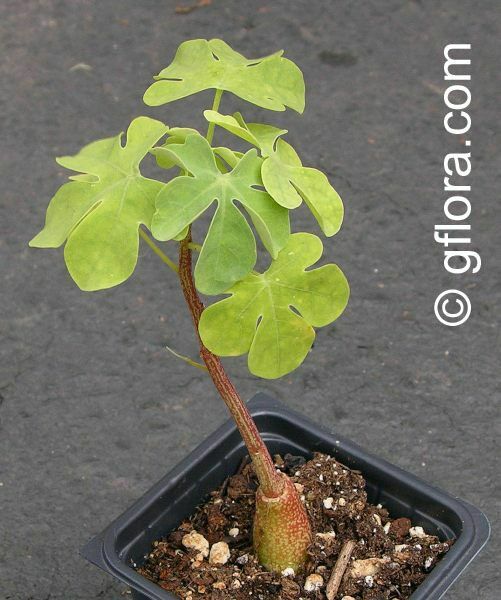 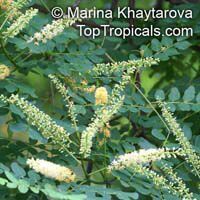 A medium-sized tree up to 15 m high, Adenanthera pavonina is native to India and Malaysia. 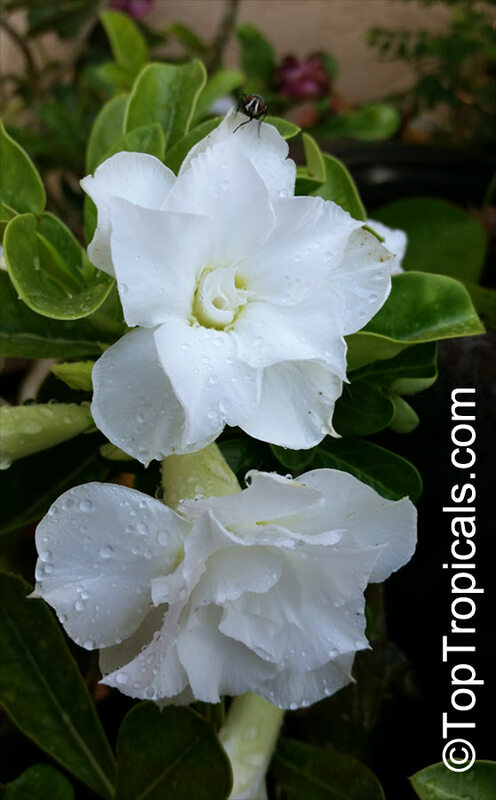 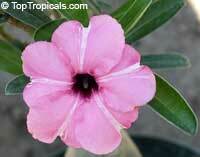 It has been planted extensively throughout the tropics as an ornamental and has become naturalized in many countries. 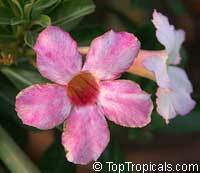 The tiny flowers are said to smell vaguely like orange blossoms. The slender flattened pods become twisted as they split open at maturity to release up to 12 brilliant red, lens - shaped, extremely hard seeds. 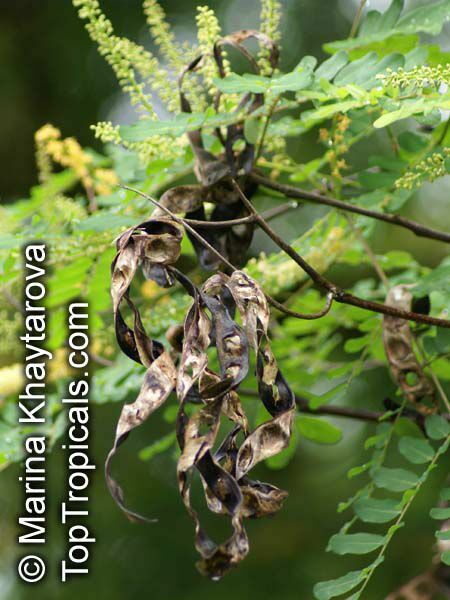 The ripened pods stay on the tree for some time. 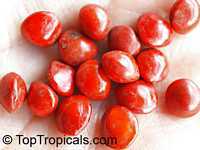 The seeds are used in necklaces and ornaments, as beads in jewellery, leis and rosaries. 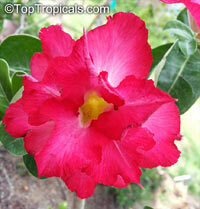 They were also used in ancient India for weighing gold. 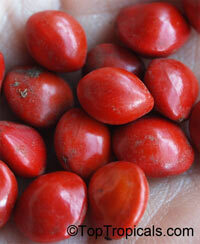 The seeds are curiously similar in weight. Four seeds make up about one gramme. 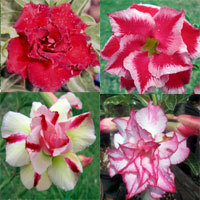 In fact the name "saga" is traced to the Arabic term for "goldsmith". 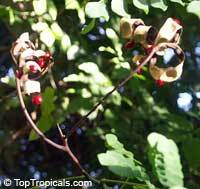 In Malaysia and Indonesia, the trees provide shade and planted as "nurse trees" in coffee, clove and rubber plantations. Although the raw seeds are toxic, when cooked they are edible: are roasted, shelled and then eaten with rice in Java, Indonesia. 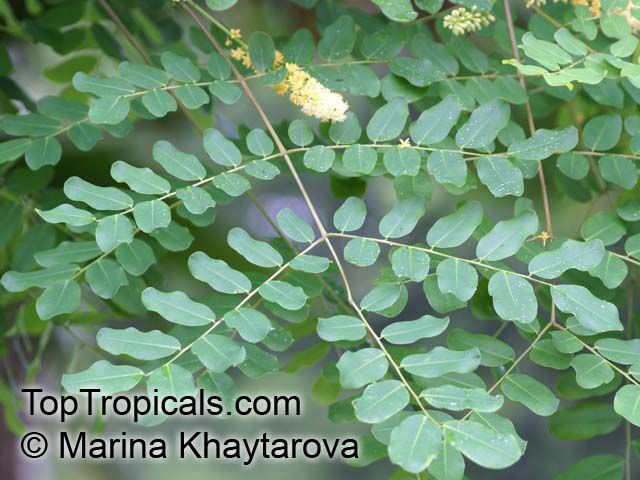 In Melanesia and Polynesia people call it the "food tree". The seeds are said to taste like soy bean. 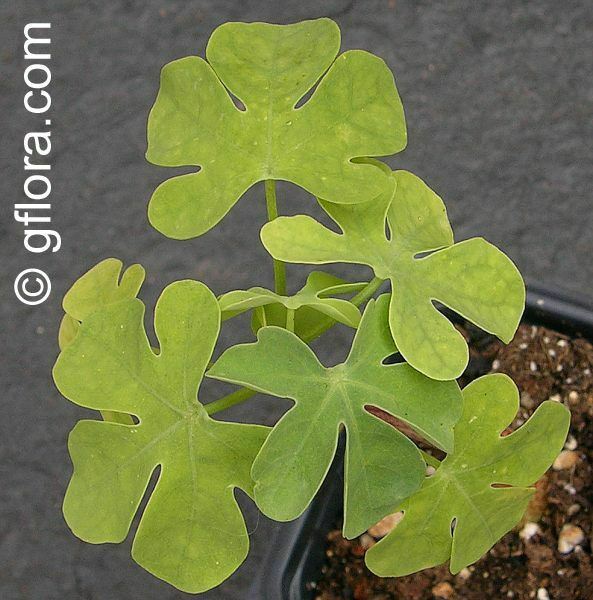 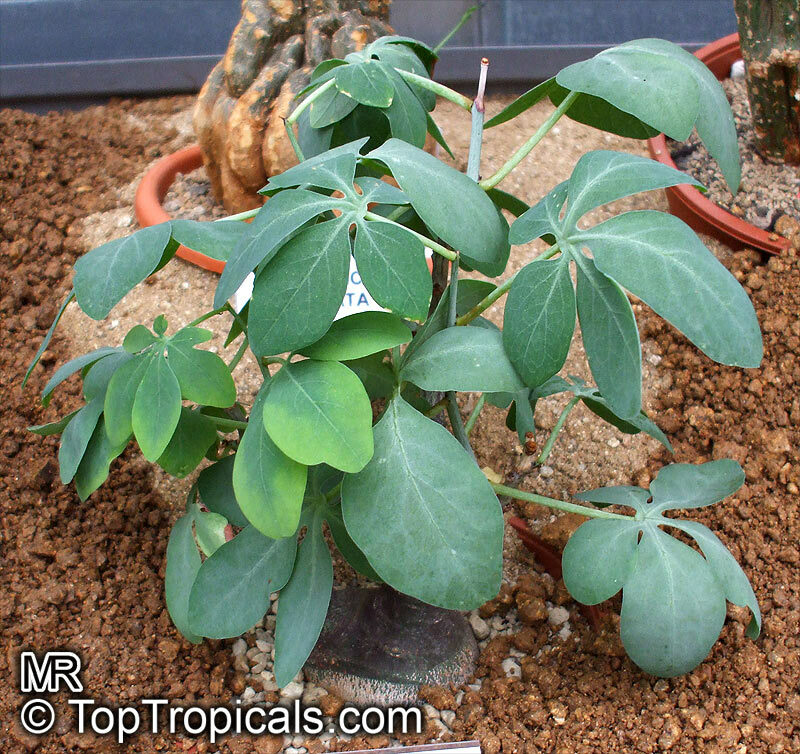 The young leaves can be cooked and eaten, but usually only during famine. The hard reddish wood of the red sandalwood tree is used for cabinet making. 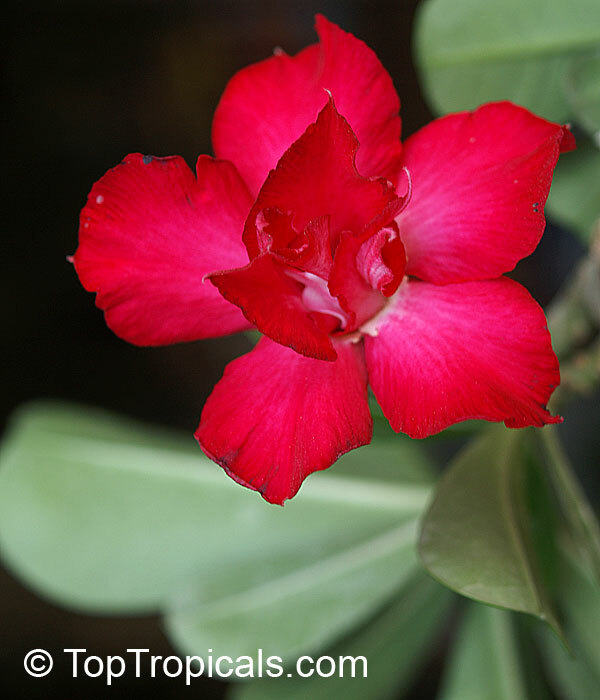 A red dye, obtained from the wood, is used by Brahmins to mark religious symbols on their foreheads. A red powder made from the wood is used as an antiseptic paste. 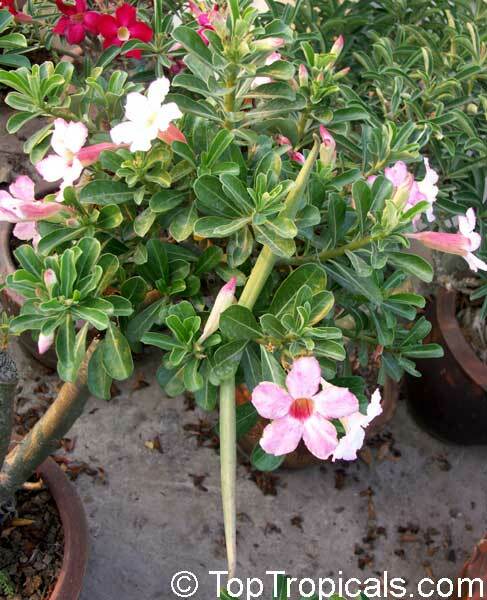 In Ancient Indian medicine, the ground seeds are used to treat boils and inflammations. 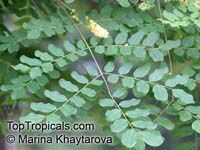 A decoction of the leaves is used to treat gout and rheumatism. The bark was used to wash hair. 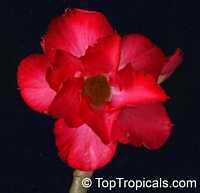 Red Sandalwood, Saga. 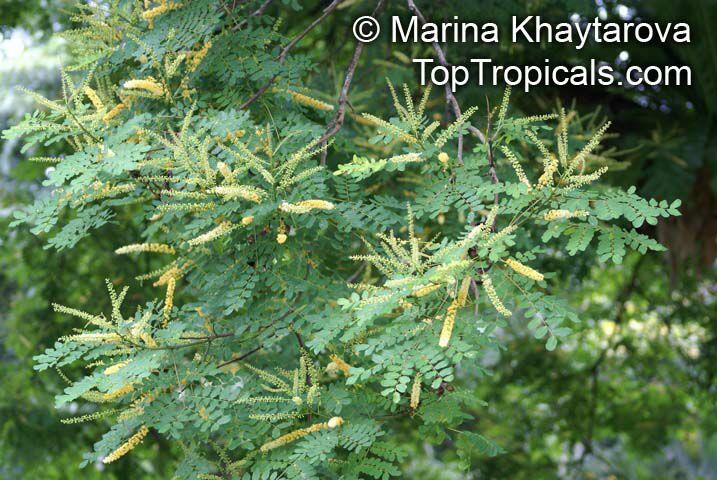 Popular Indian tree with many uses. 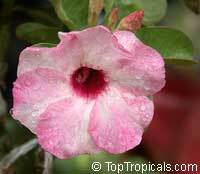 The tiny flowers are said to smell vaguely like orange blossoms. The seeds are used in necklaces and ornaments, as beads in jewellery, leis and rosaries. 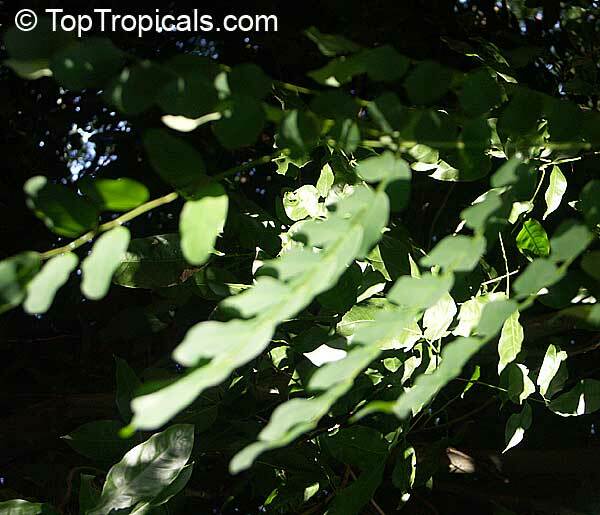 In Malaysia and Indonesia, the trees provide shade and planted as "nurse trees" in coffee, clove and rubber plantations. Seeds are roasted and then eaten with rice in Java, Indonesia. 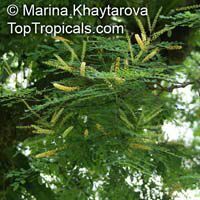 In Melanesia and Polynesia people call it the "food tree". 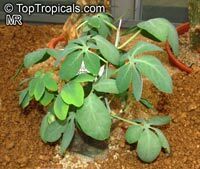 The seeds are said to taste like soy bean. A red powder made from the wood is used as an antiseptic paste. Plant seeds 1" deep in otting mix, keep warm, damp and in bright light. 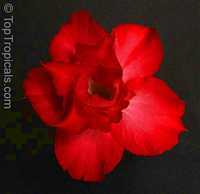 Scarify to expedite germination. 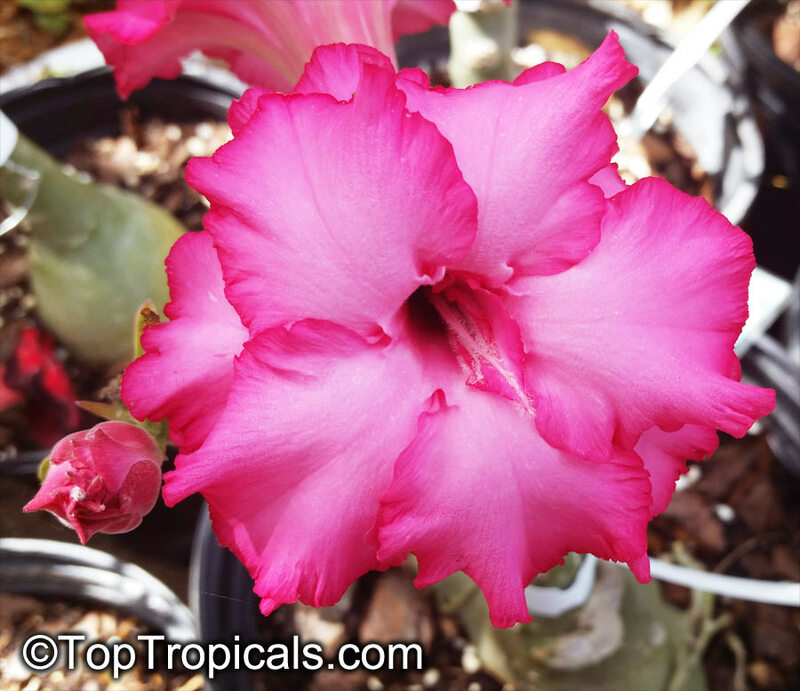 3470 Adenium Diamond Ring, Grafted ? 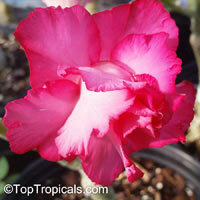 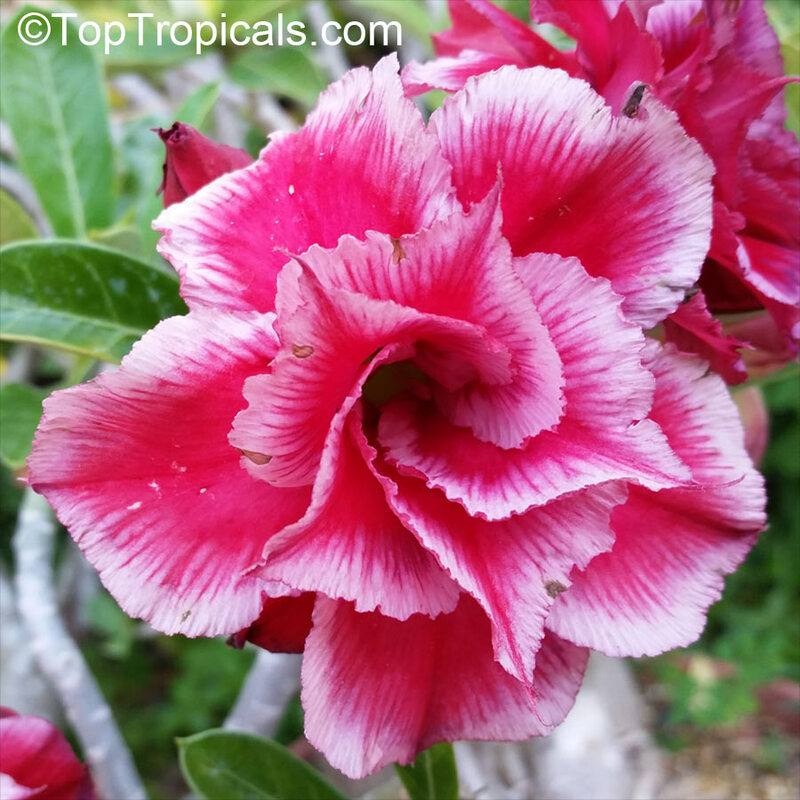 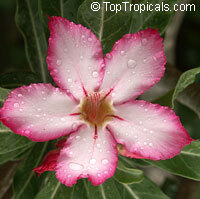 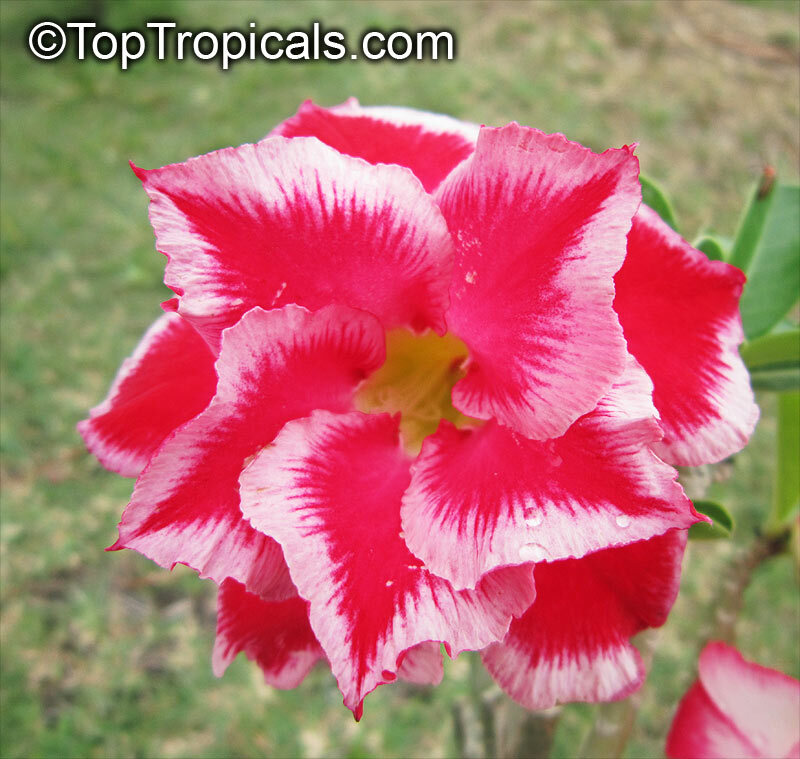 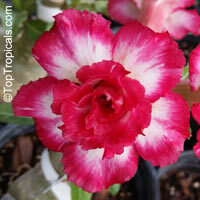 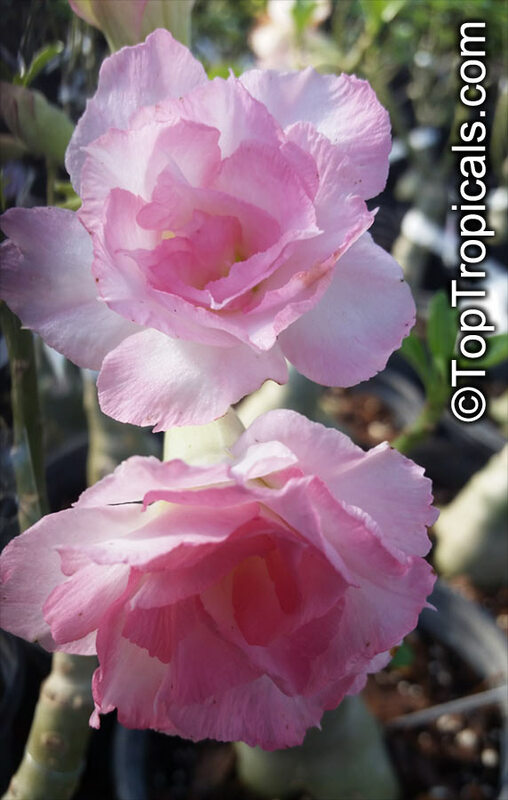 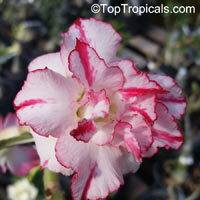 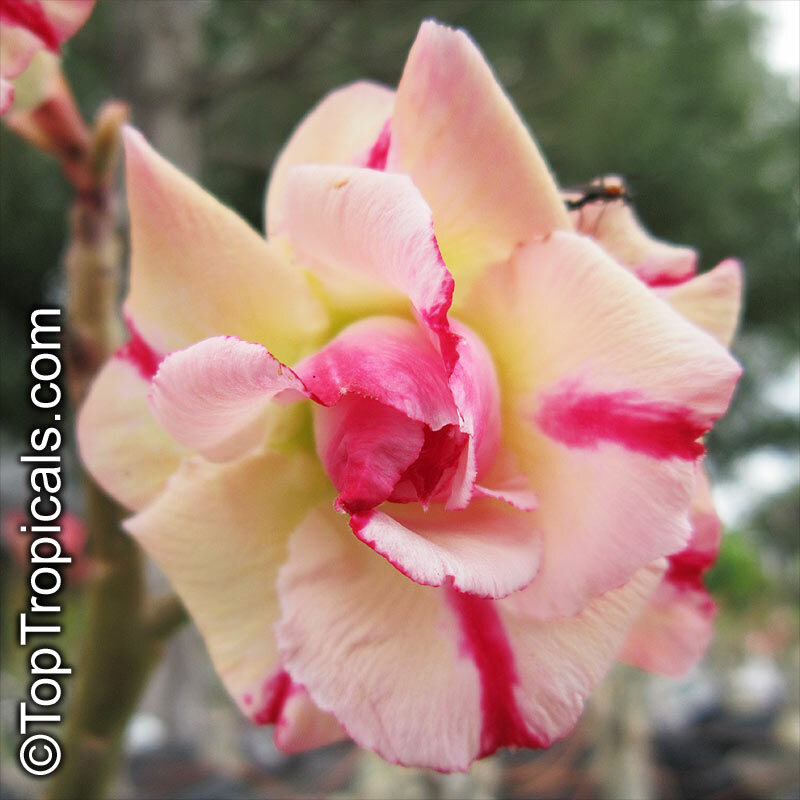 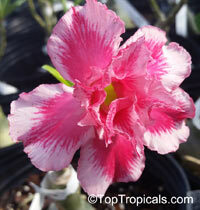 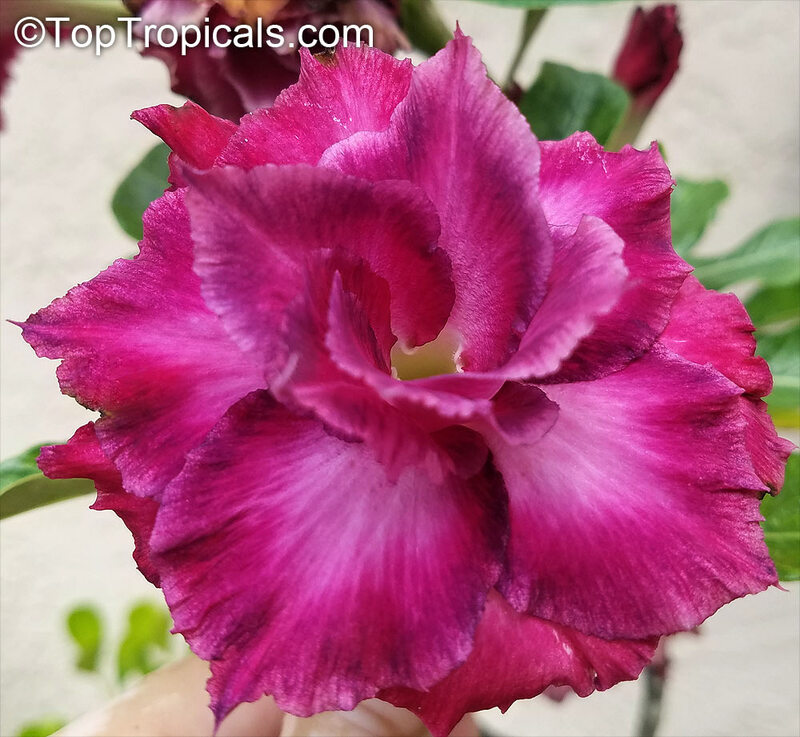 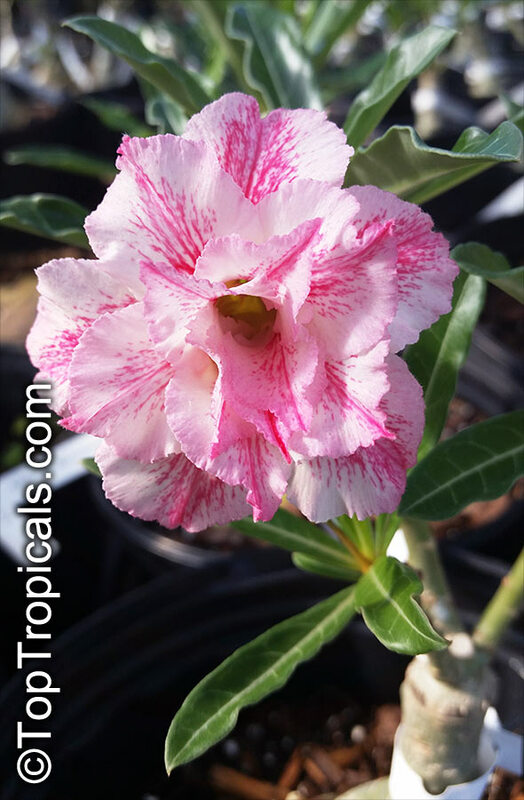 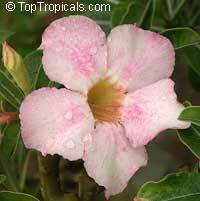 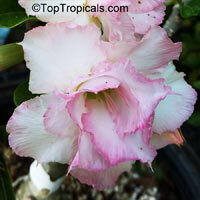 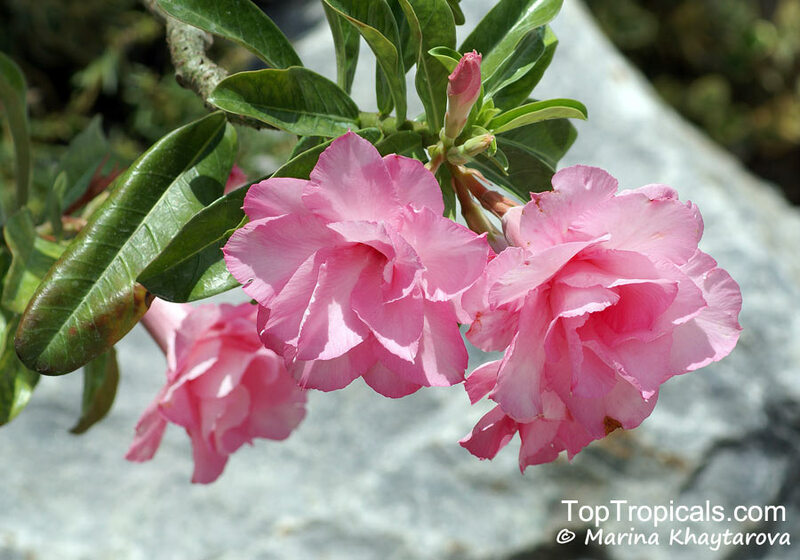 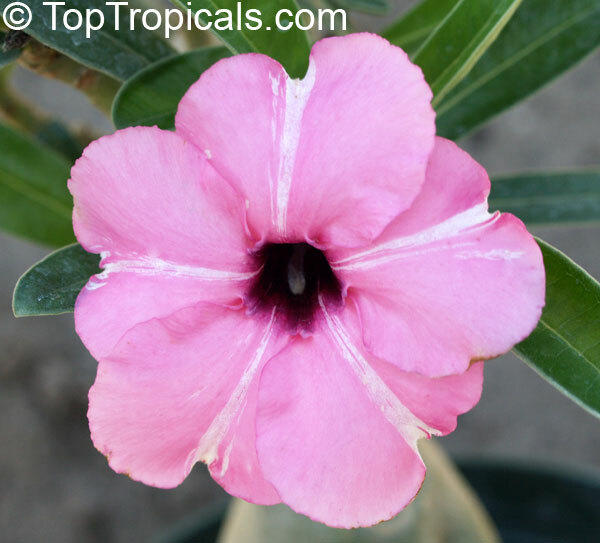 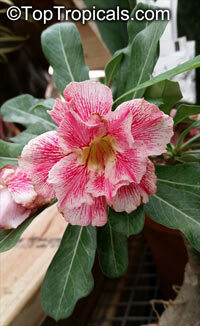 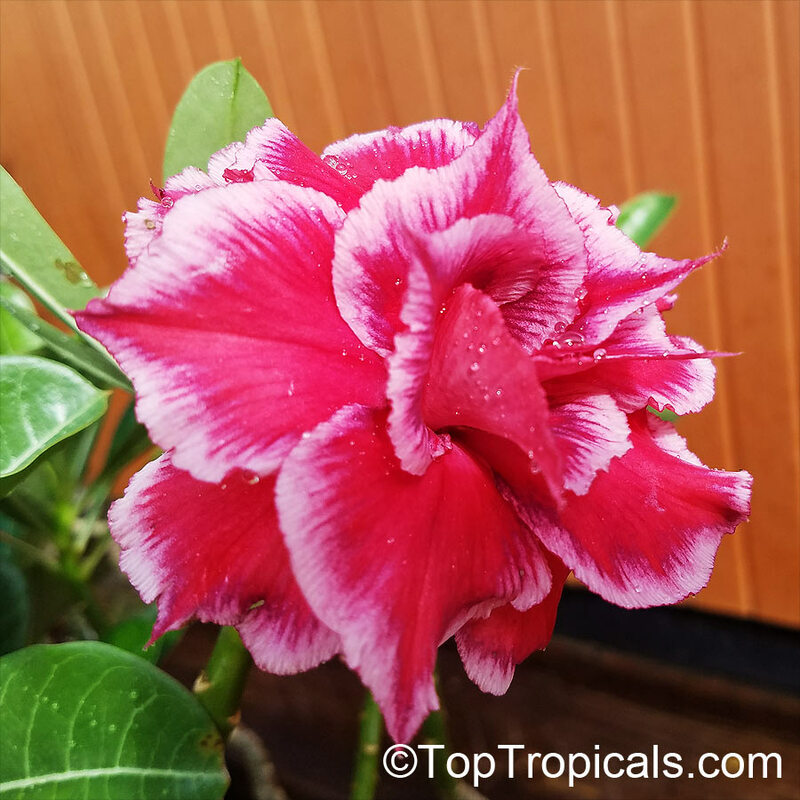 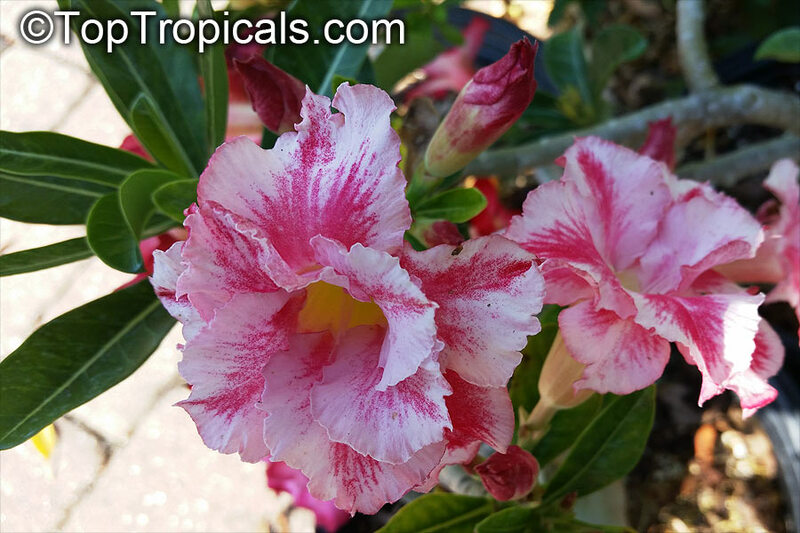 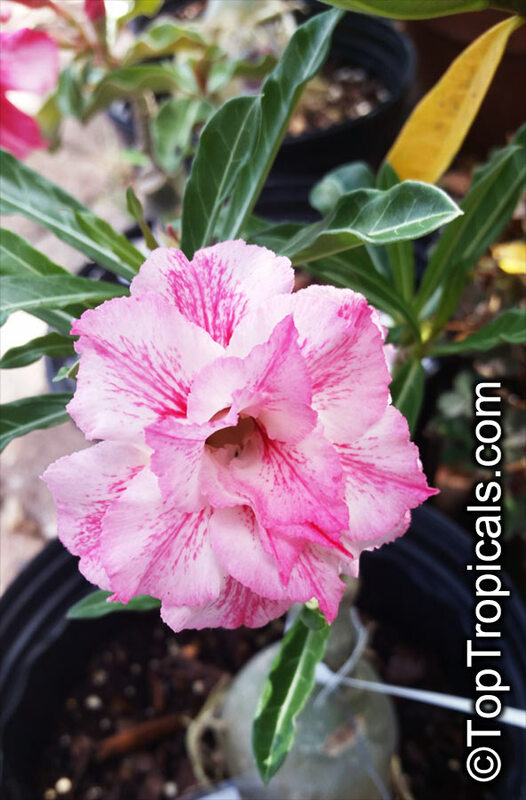 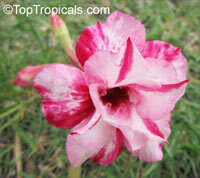 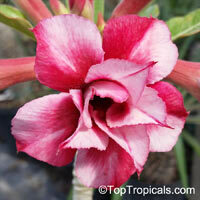 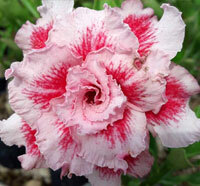 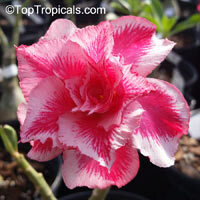 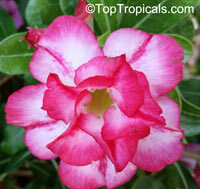 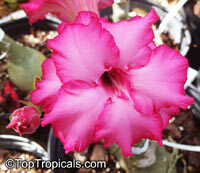 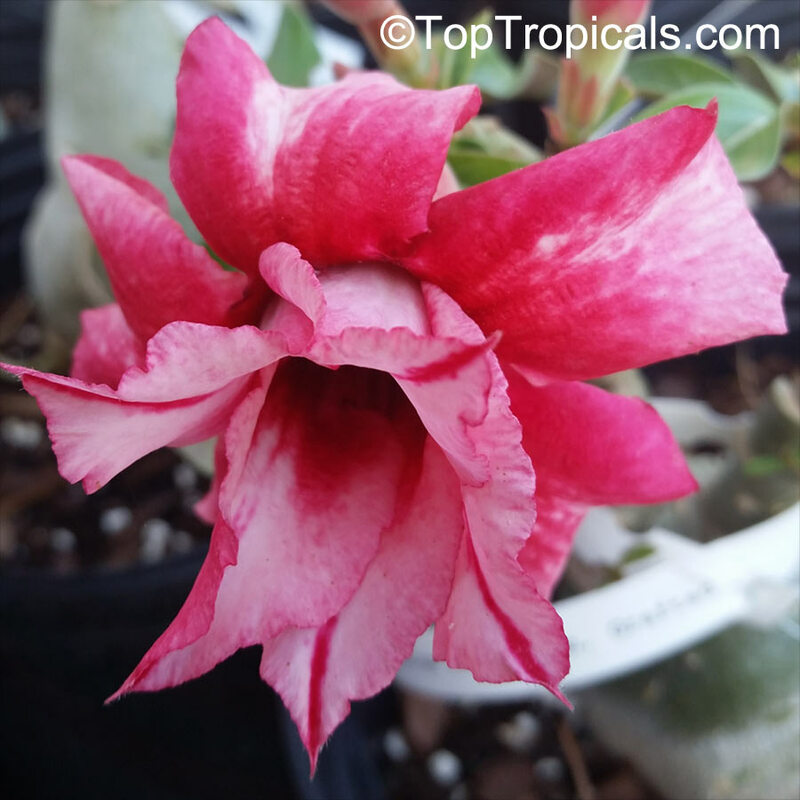 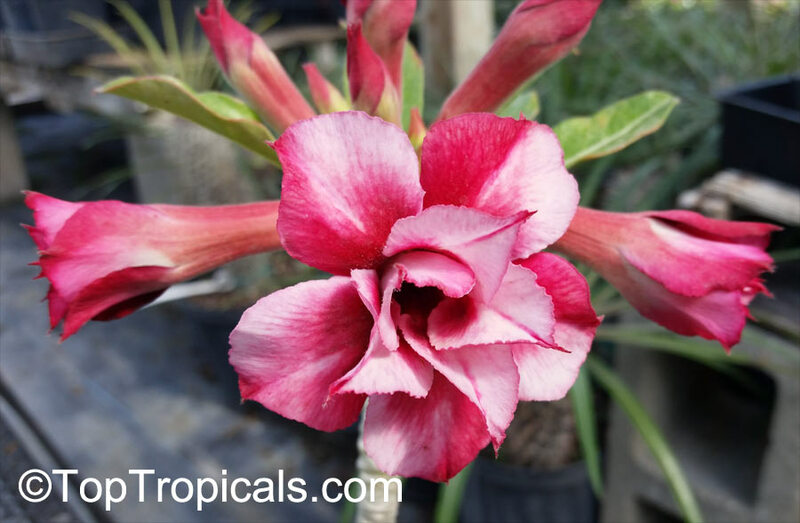 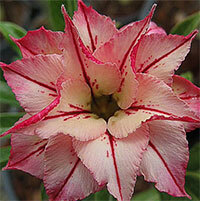 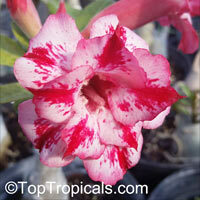 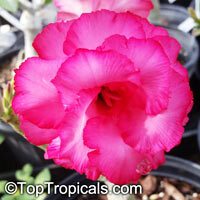 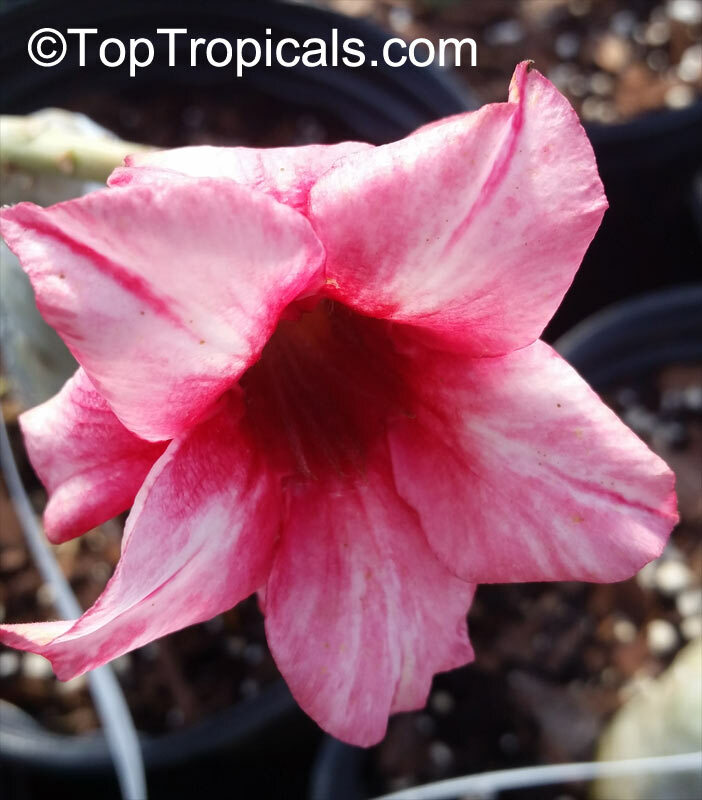 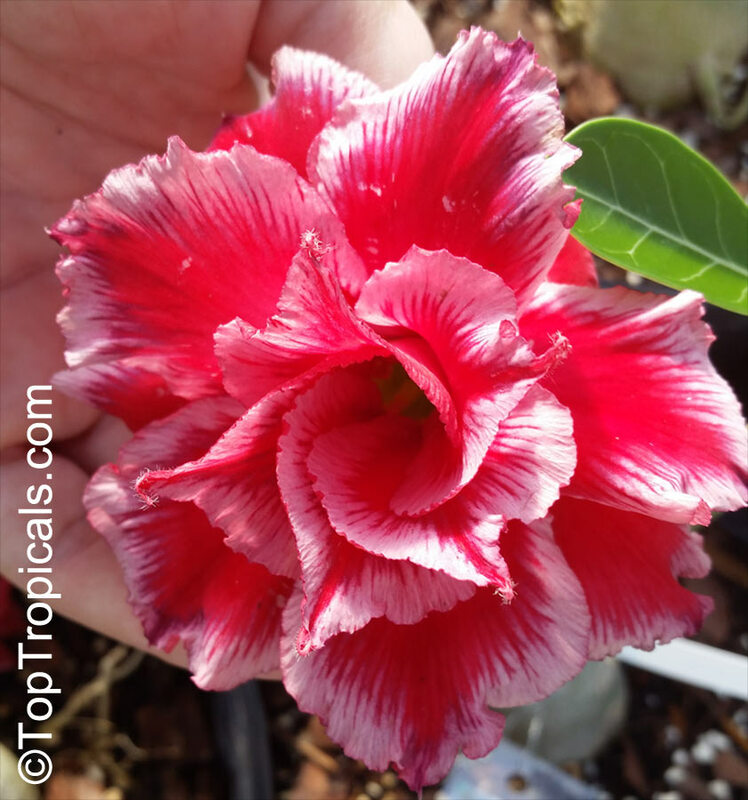 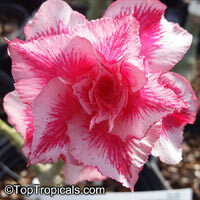 Exotic color of Desert Rose, one of the most beautiful color varieties - pink w/white sparkle/star. 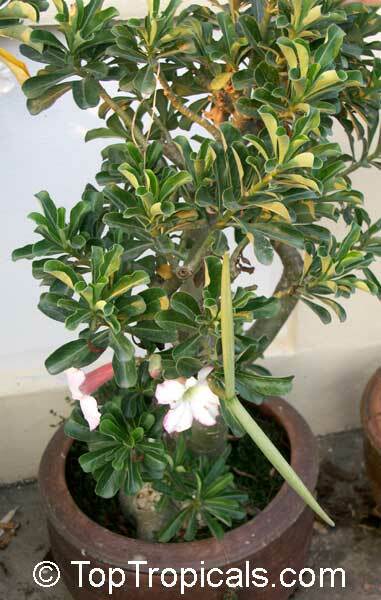 The plant is with caudex, blooming size. See picture of the flower. 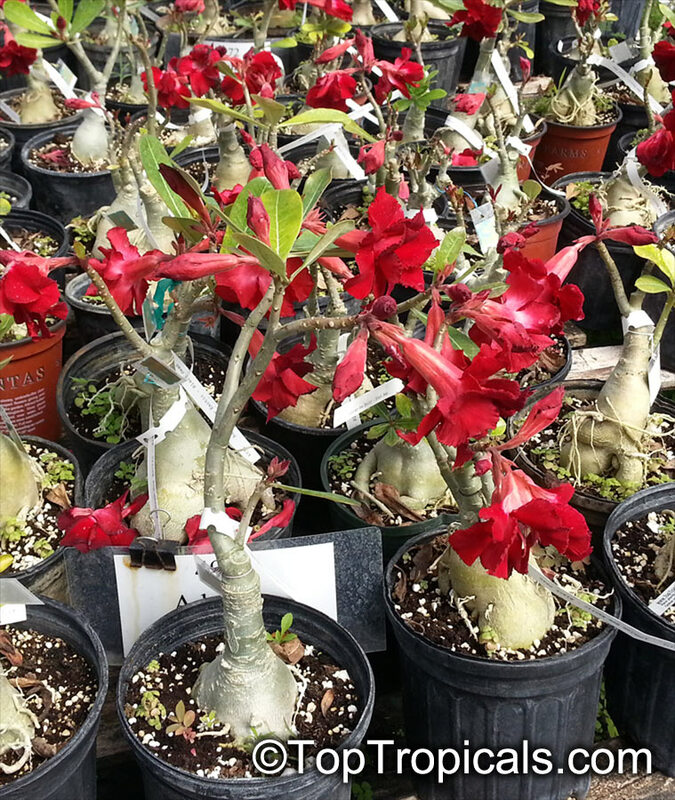 4566 Adenium Pettunear, Grafted ? 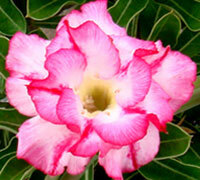 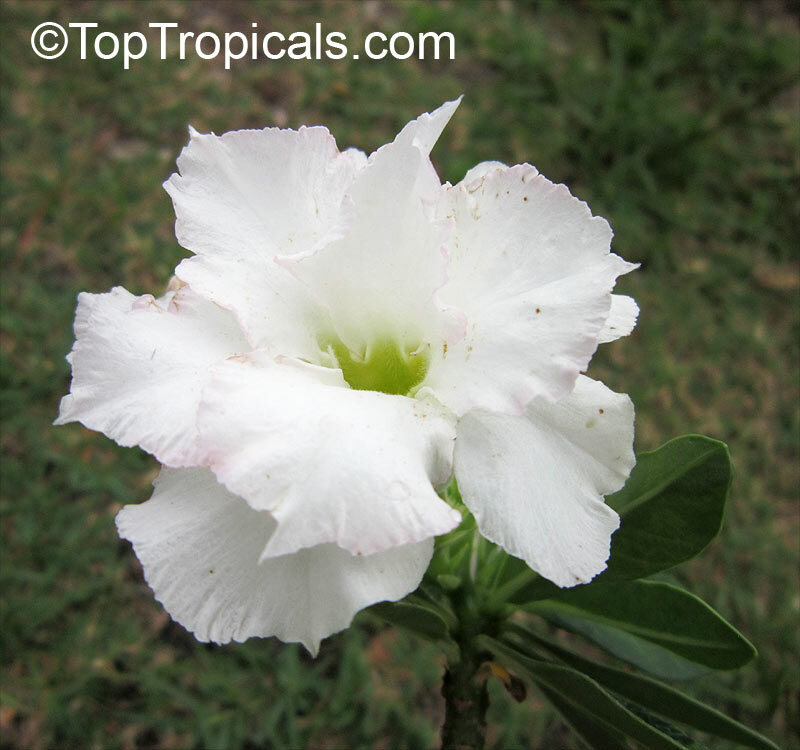 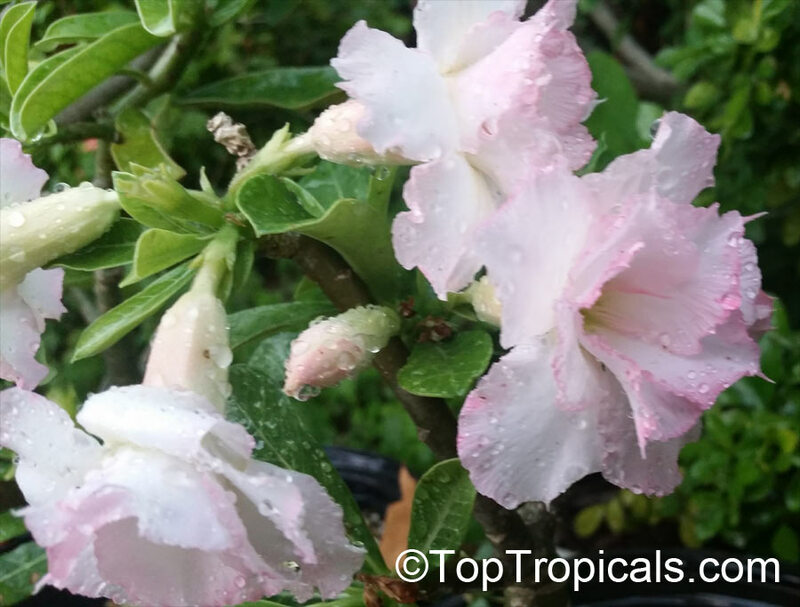 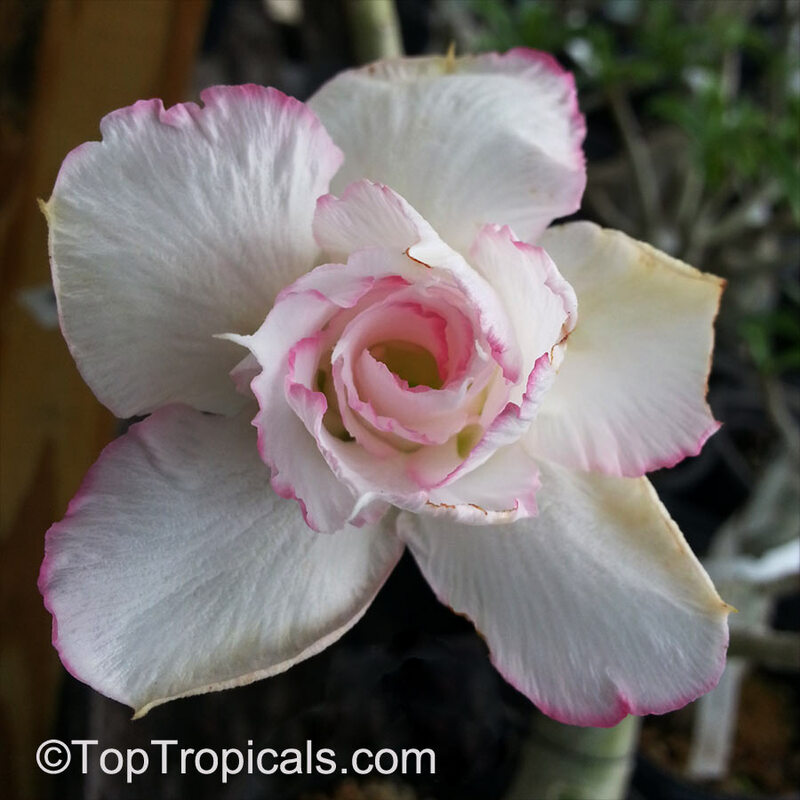 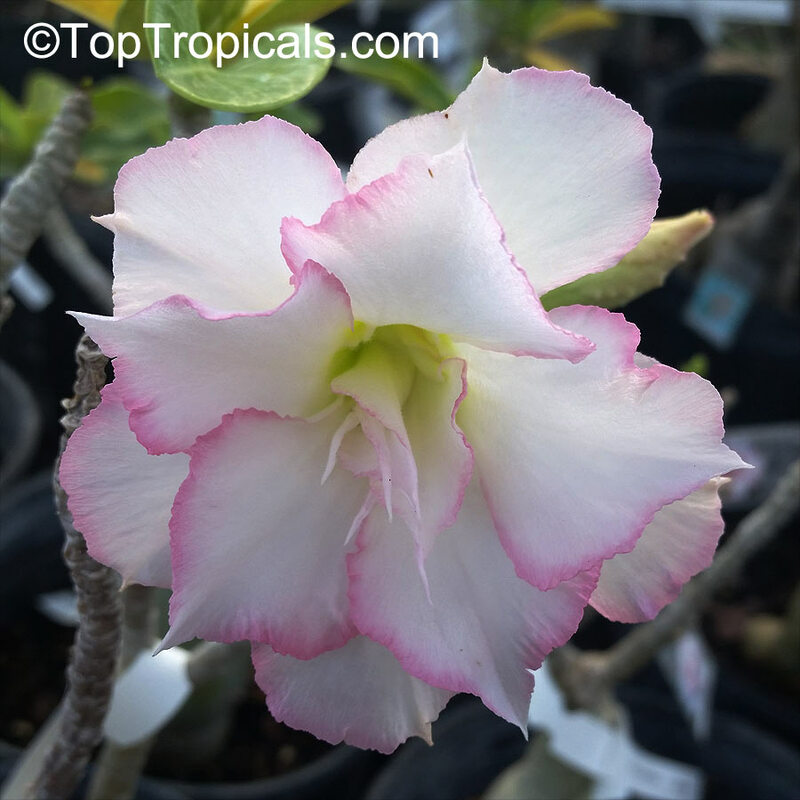 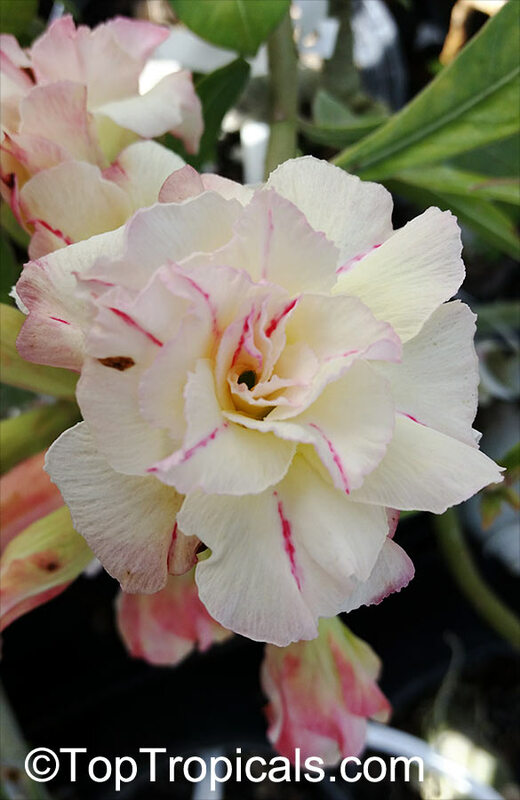 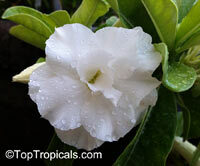 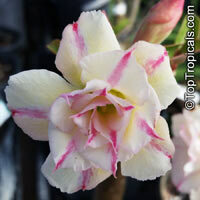 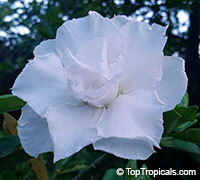 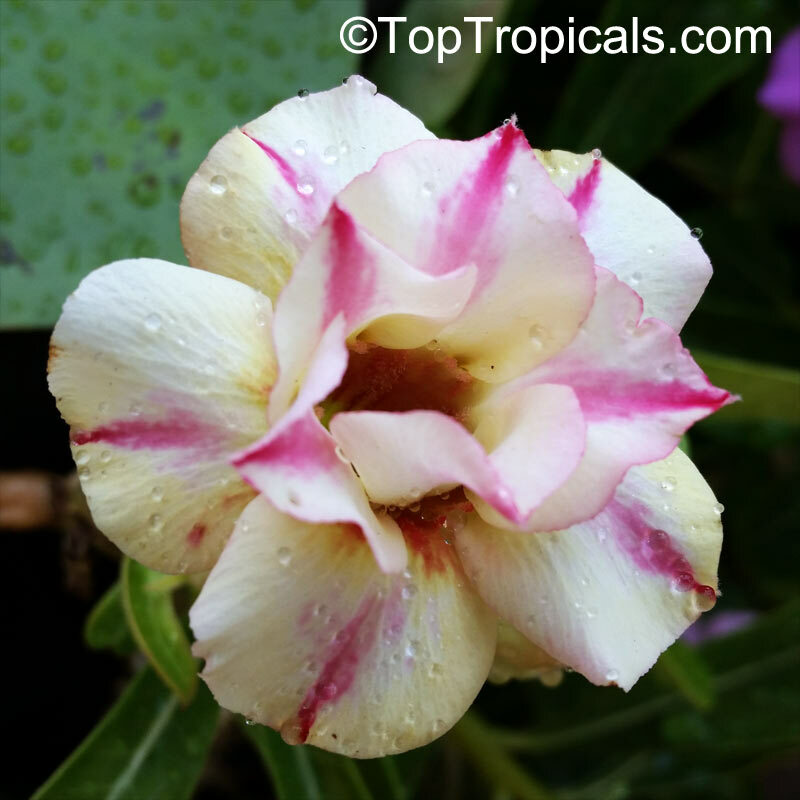 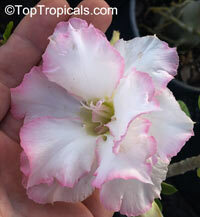 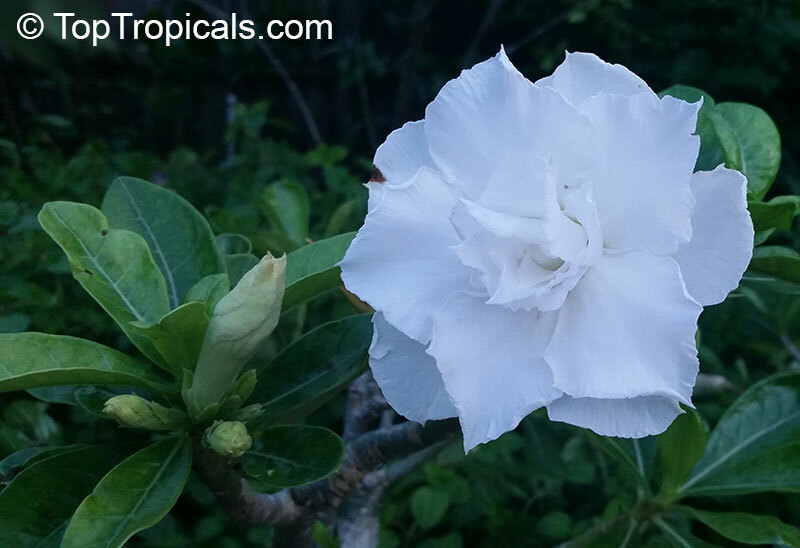 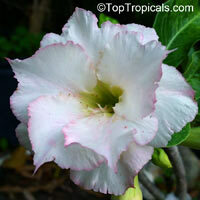 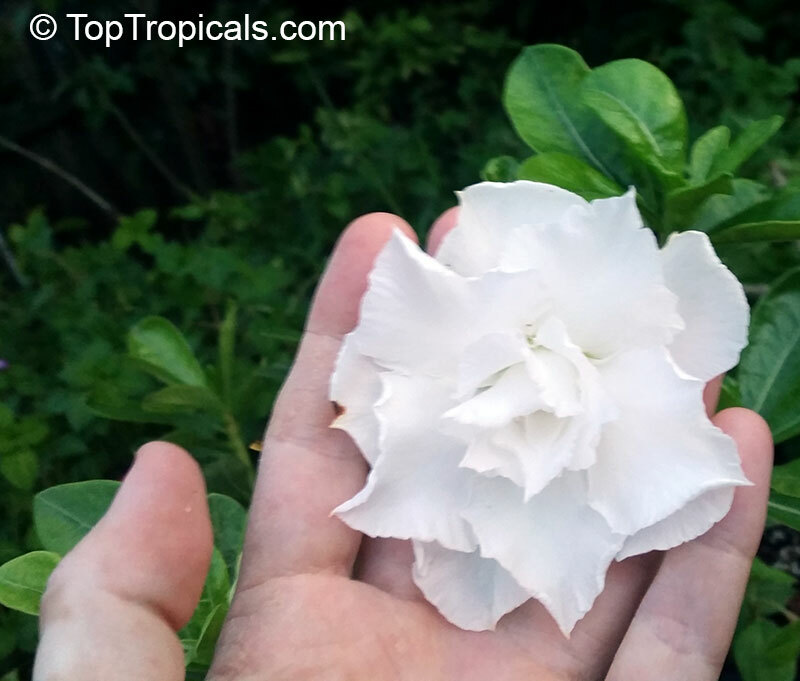 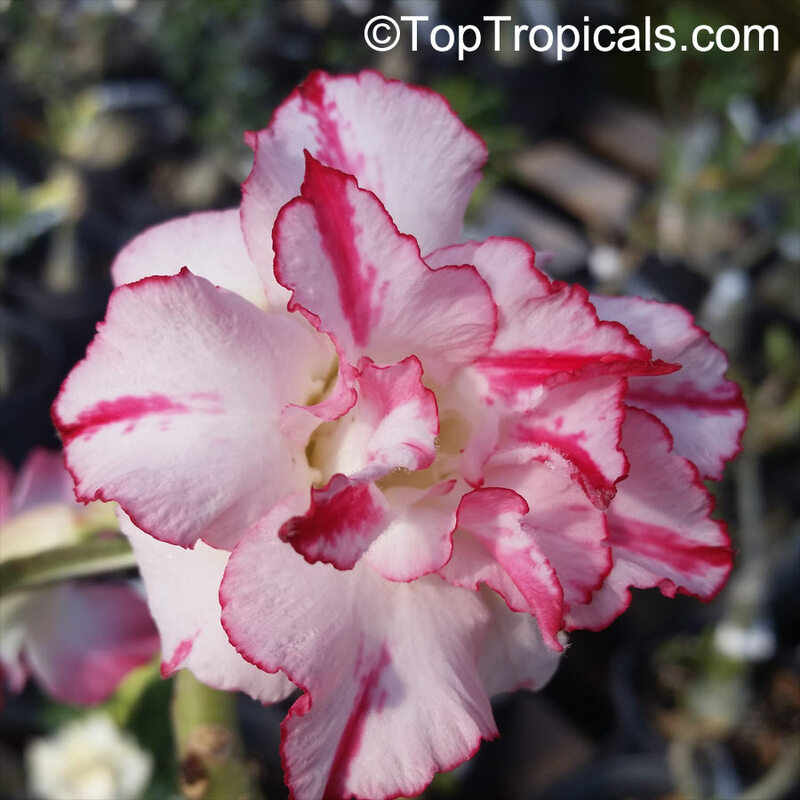 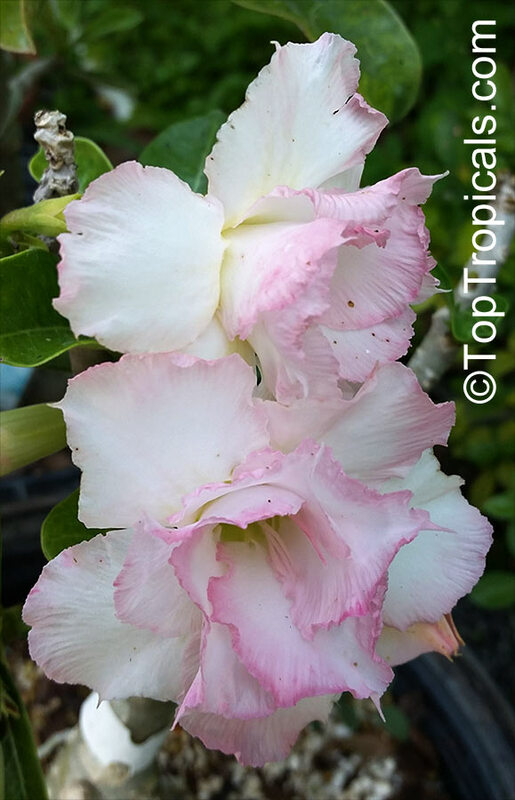 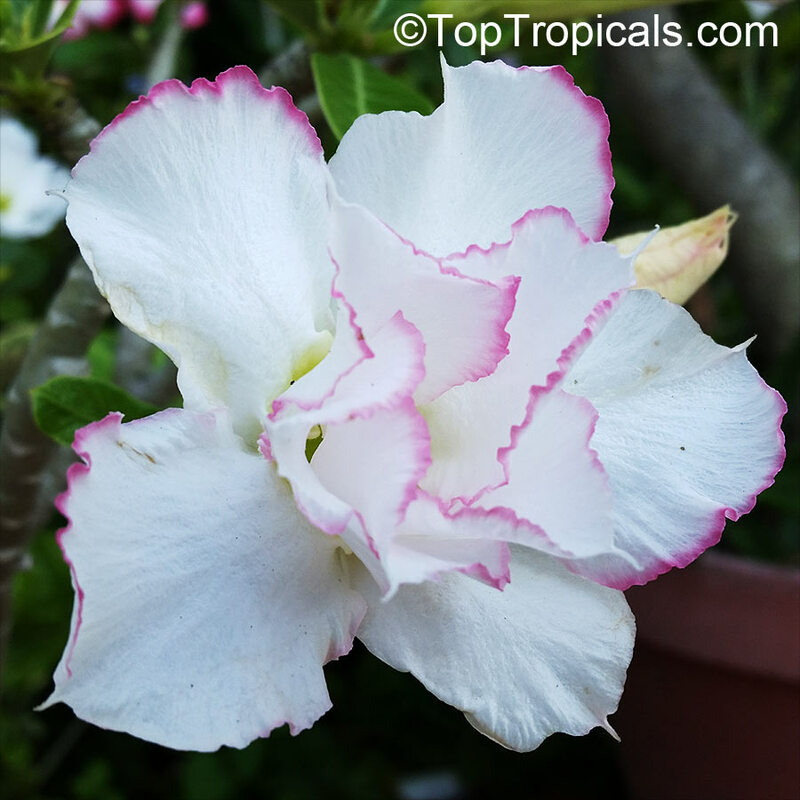 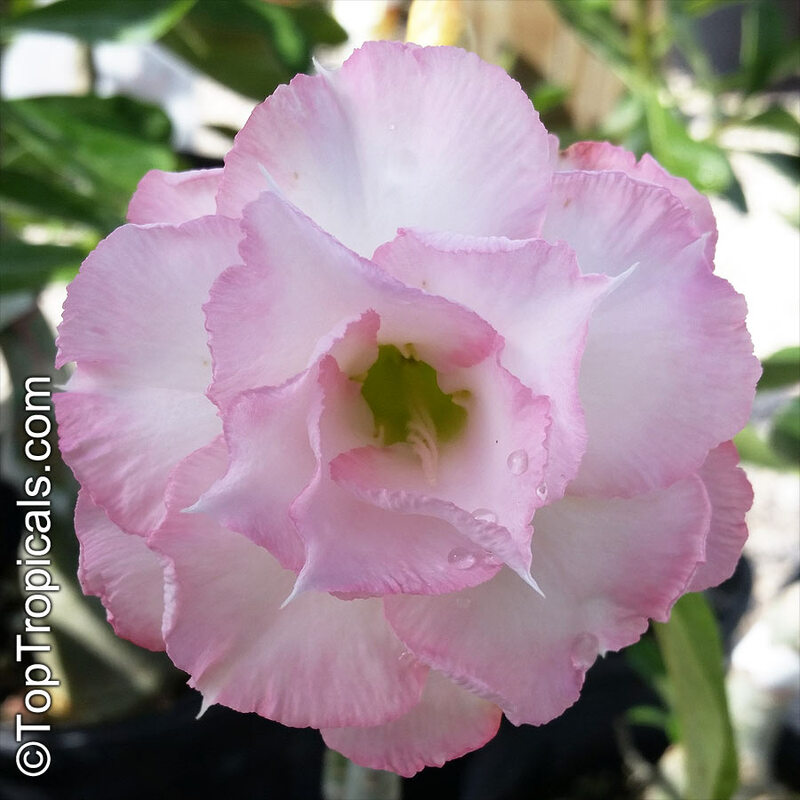 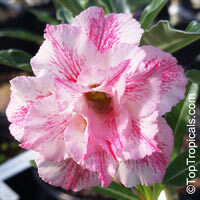 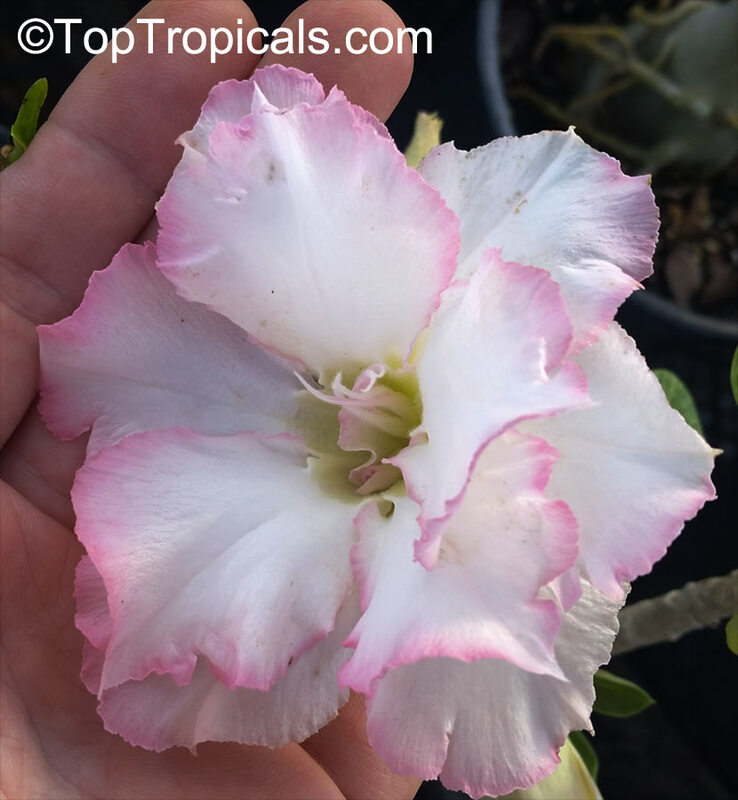 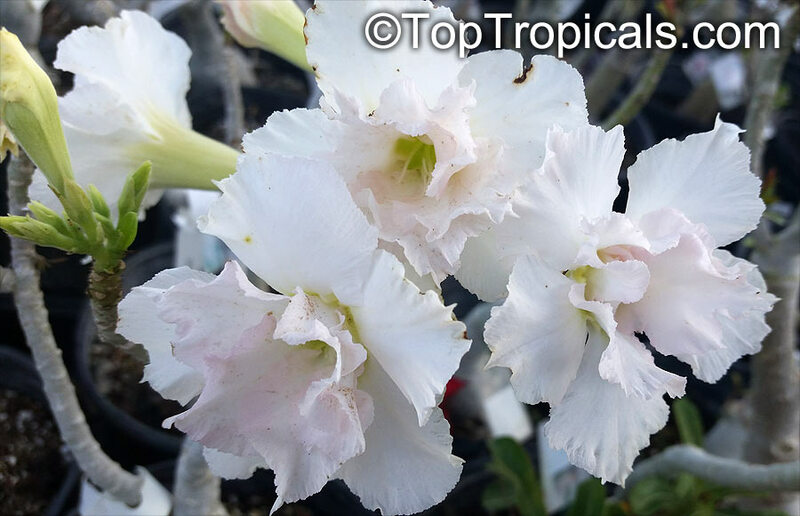 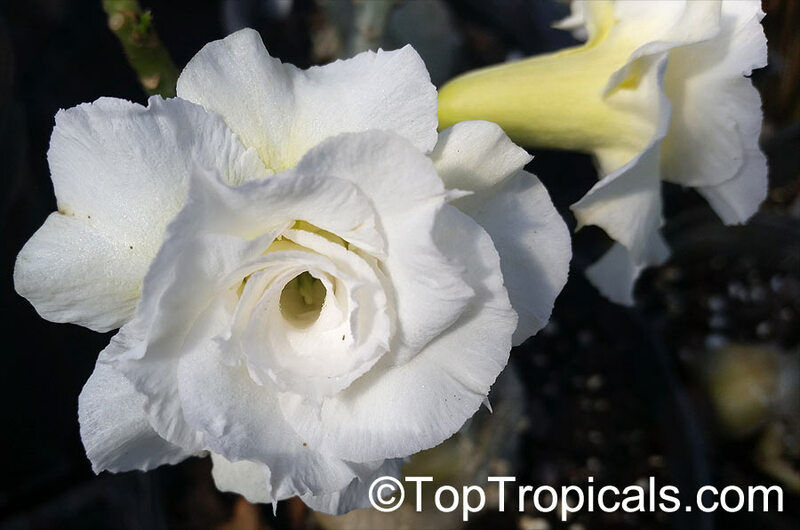 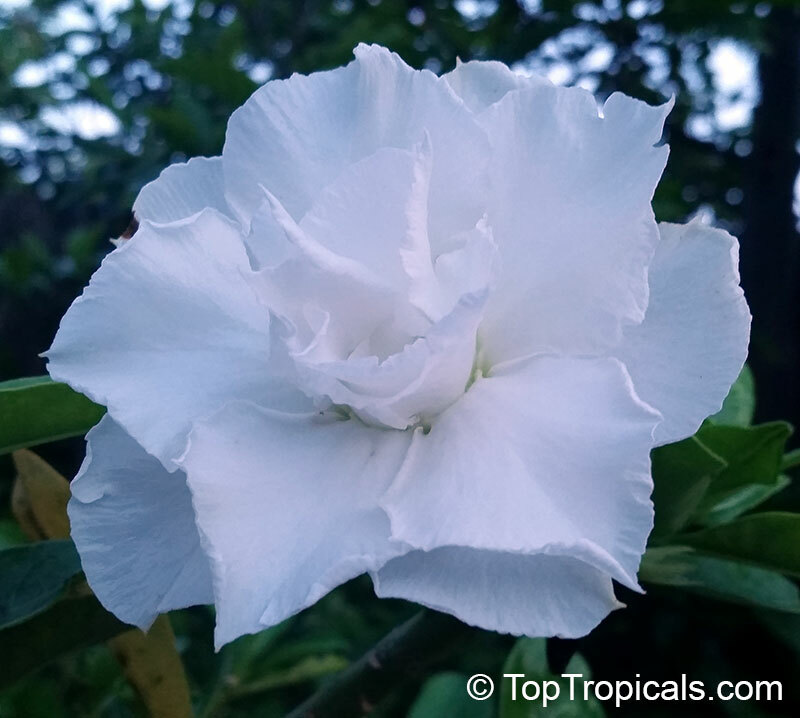 Exotic color of Desert Rose, one of the most beautiful color varieties - white flower with some pink. The plant is with caudex, blooming size. 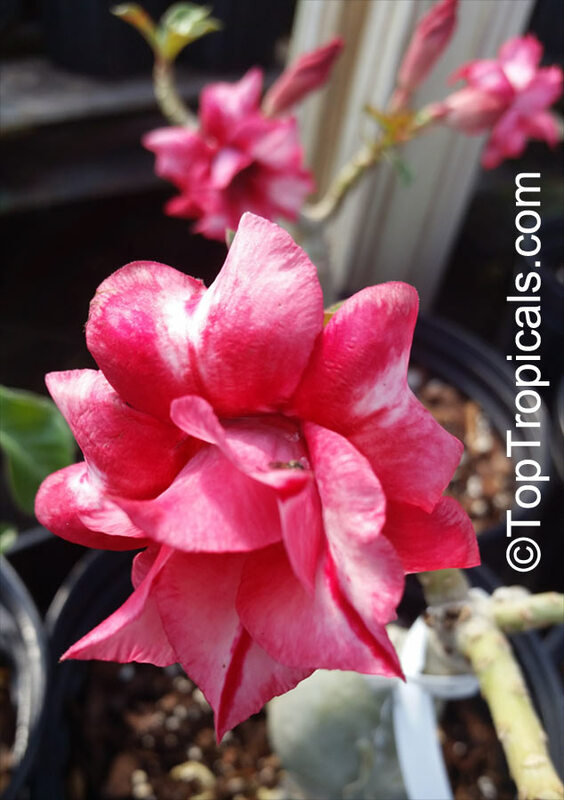 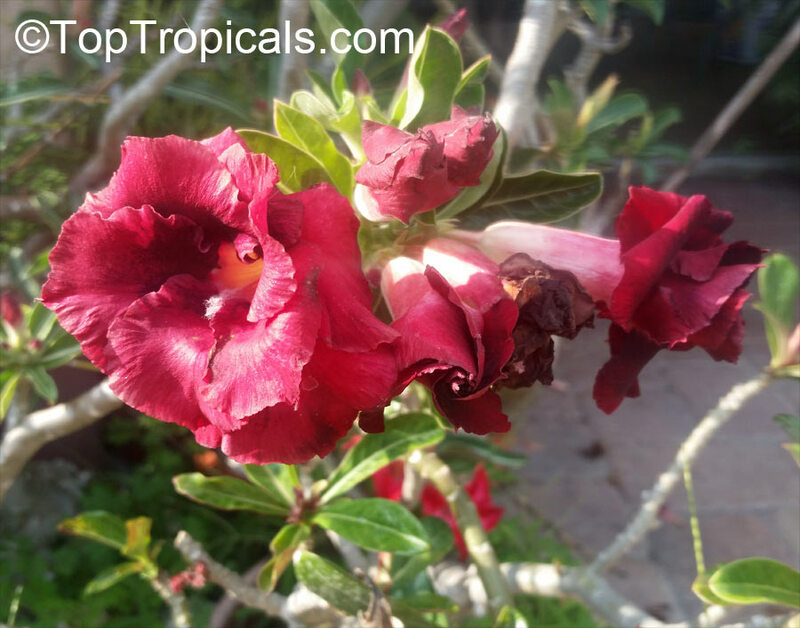 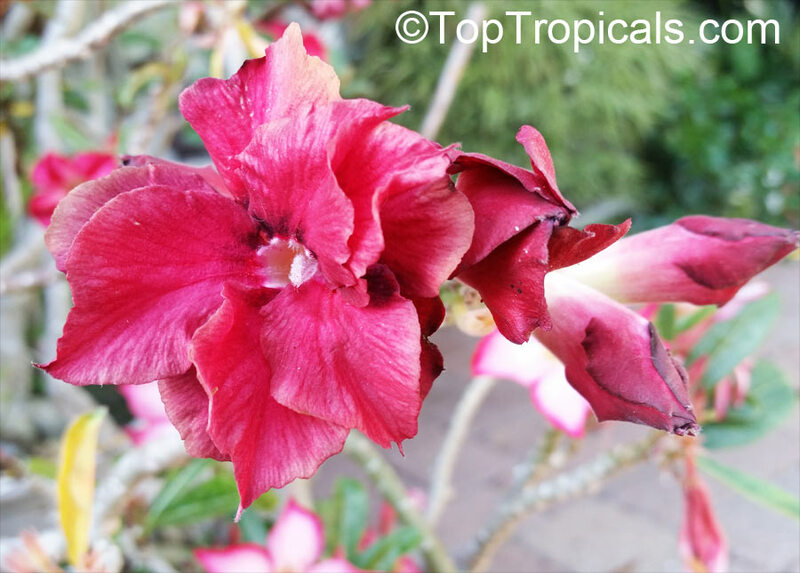 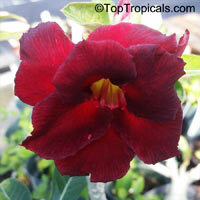 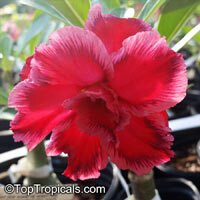 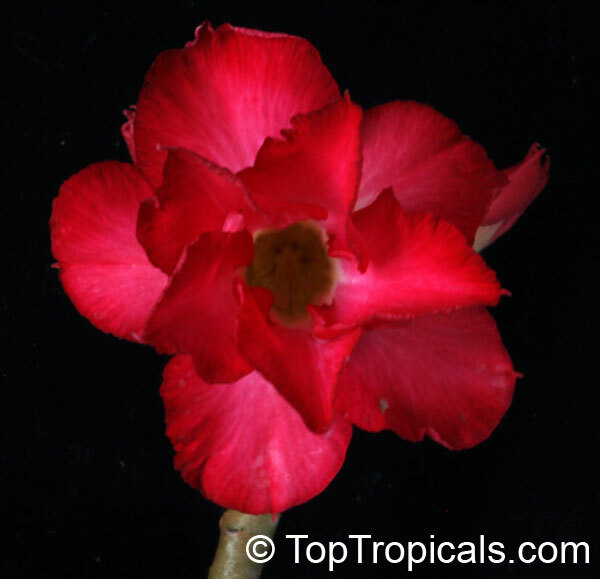 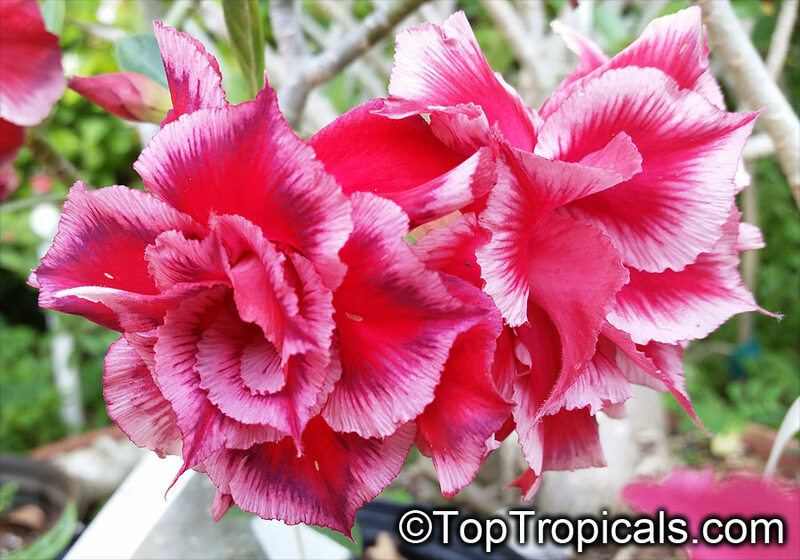 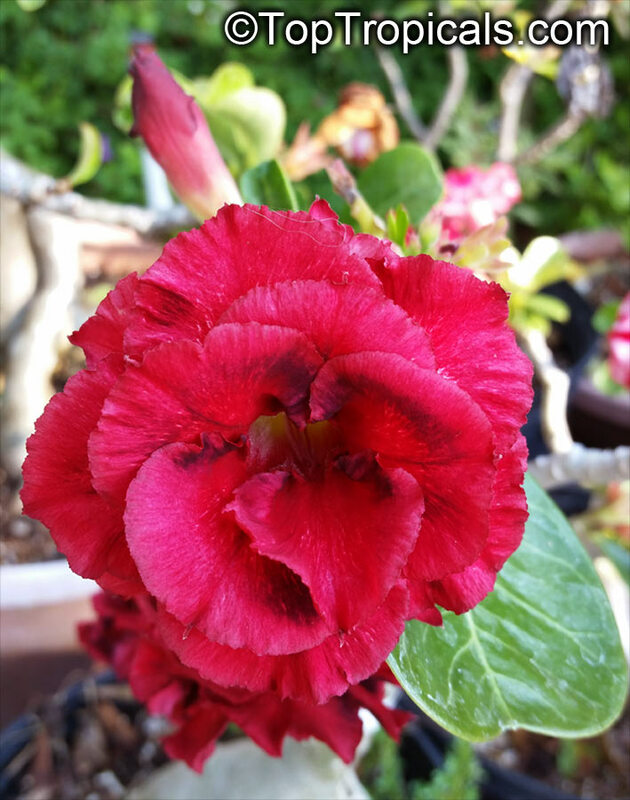 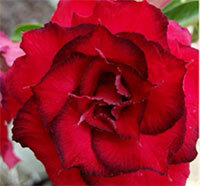 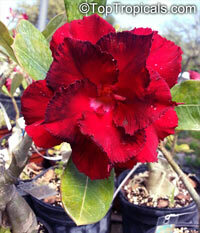 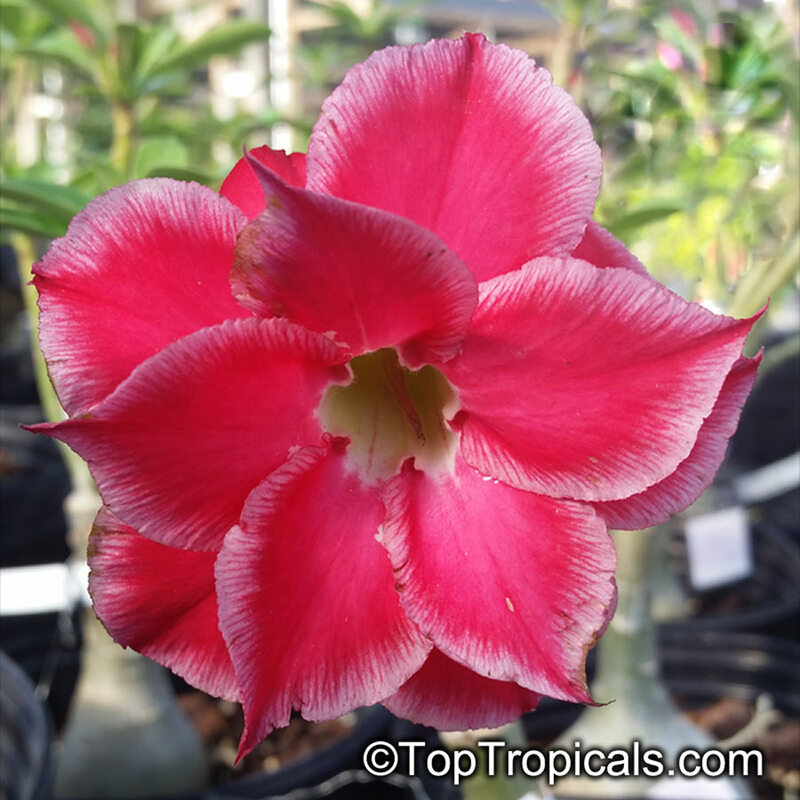 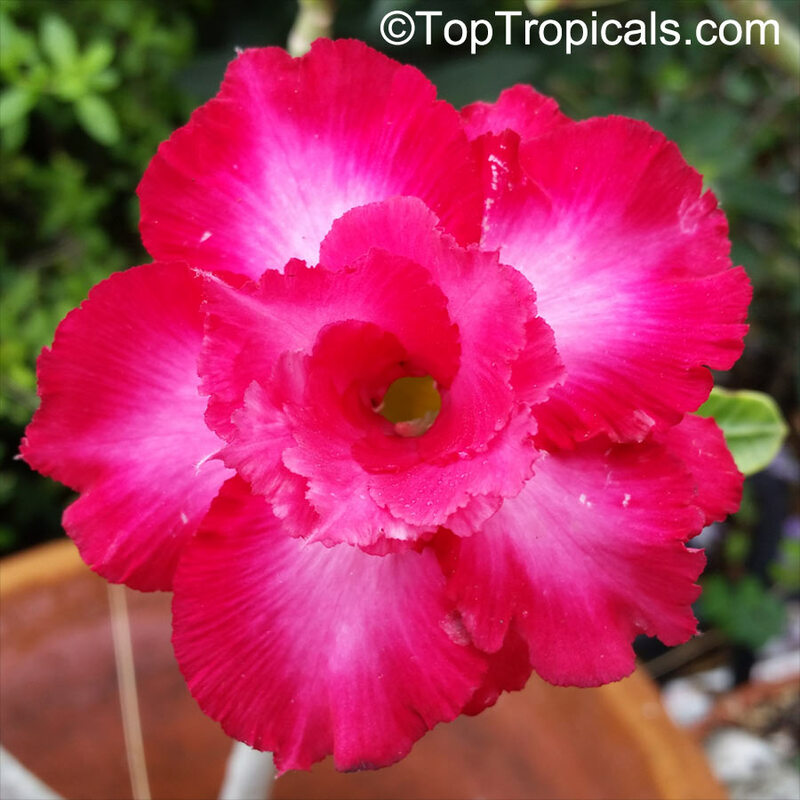 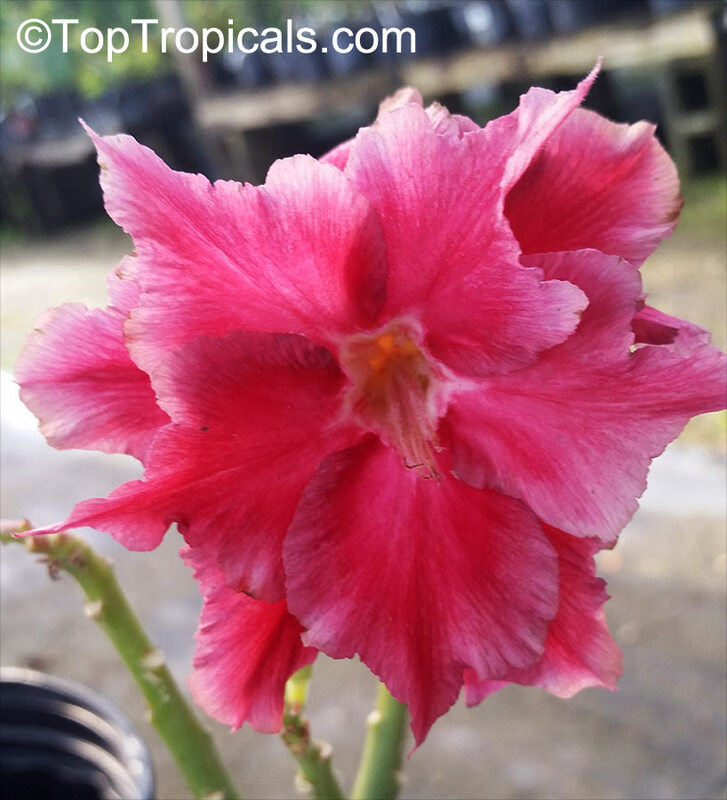 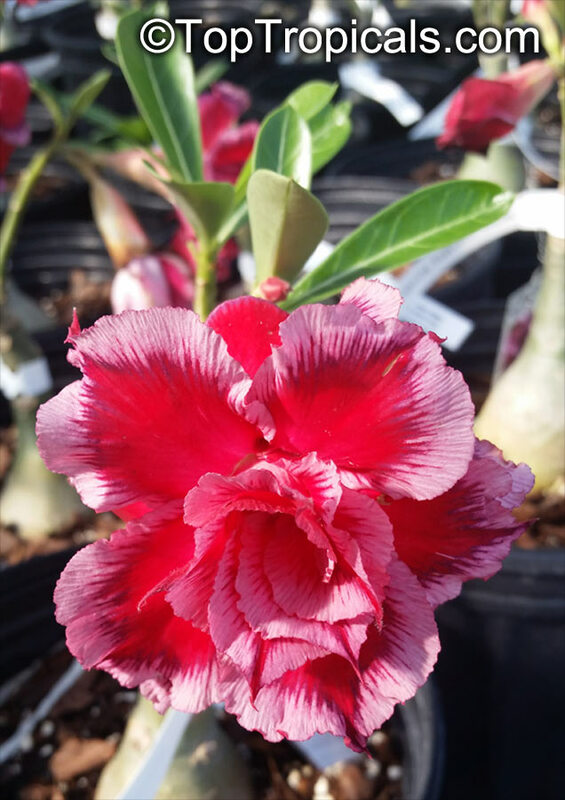 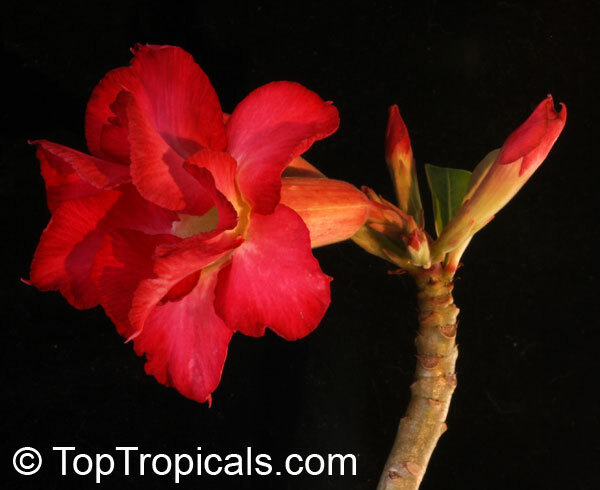 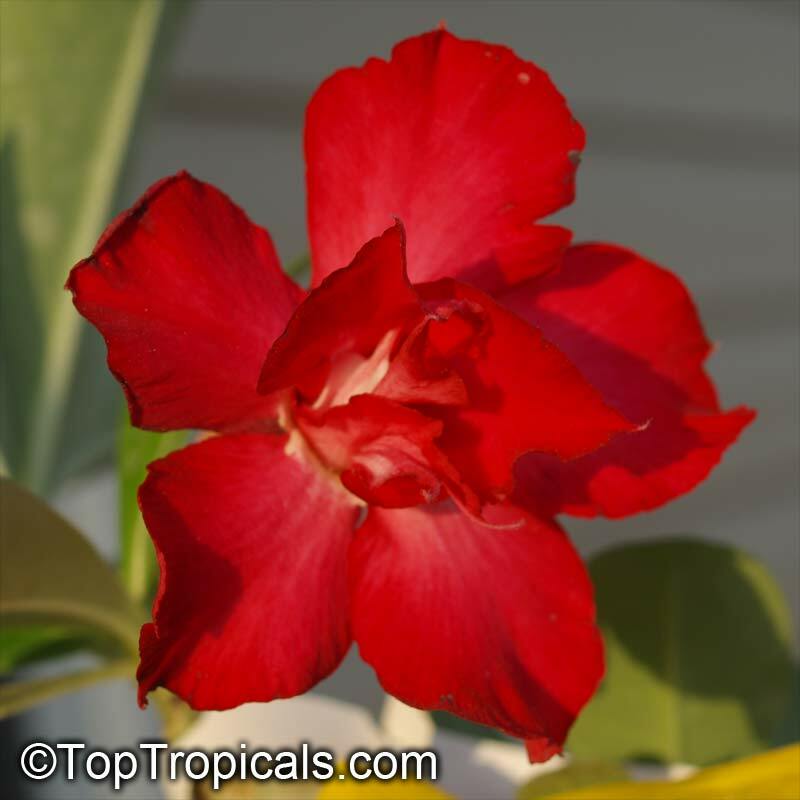 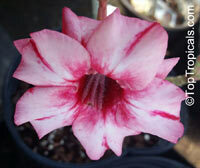 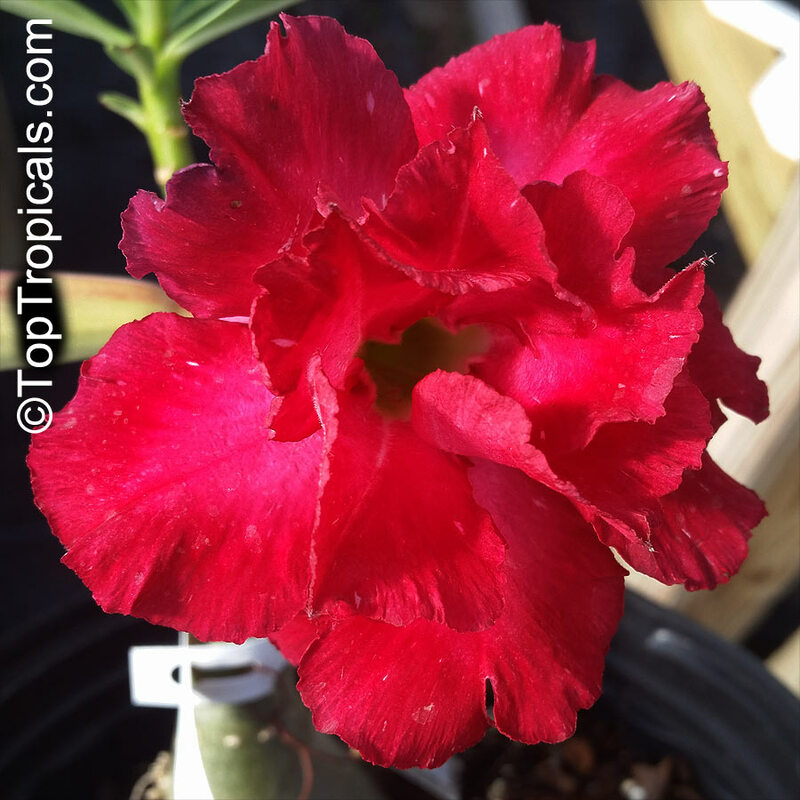 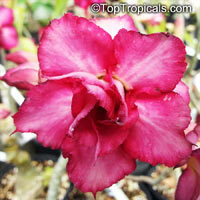 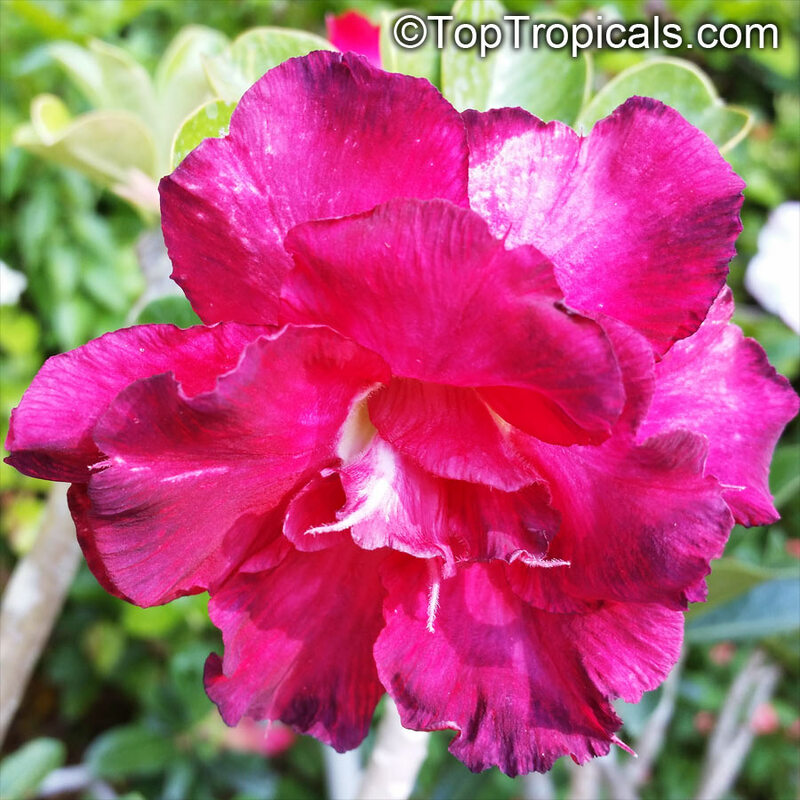 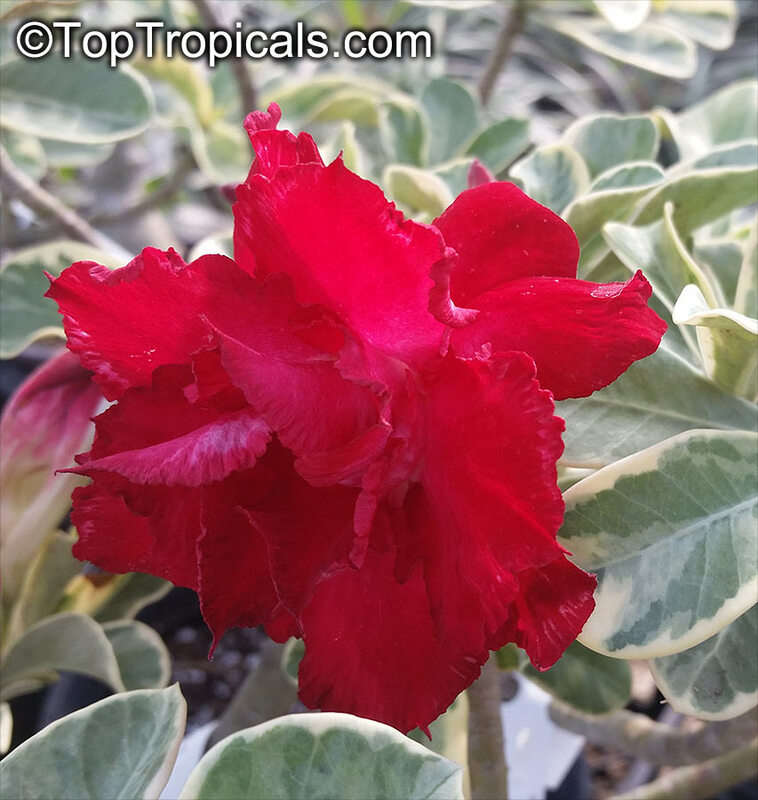 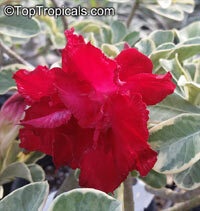 The first double flowered variety of Adenium that we obtained was bright red color. 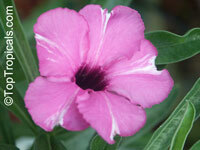 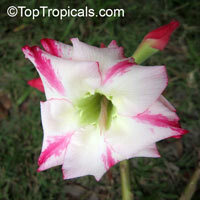 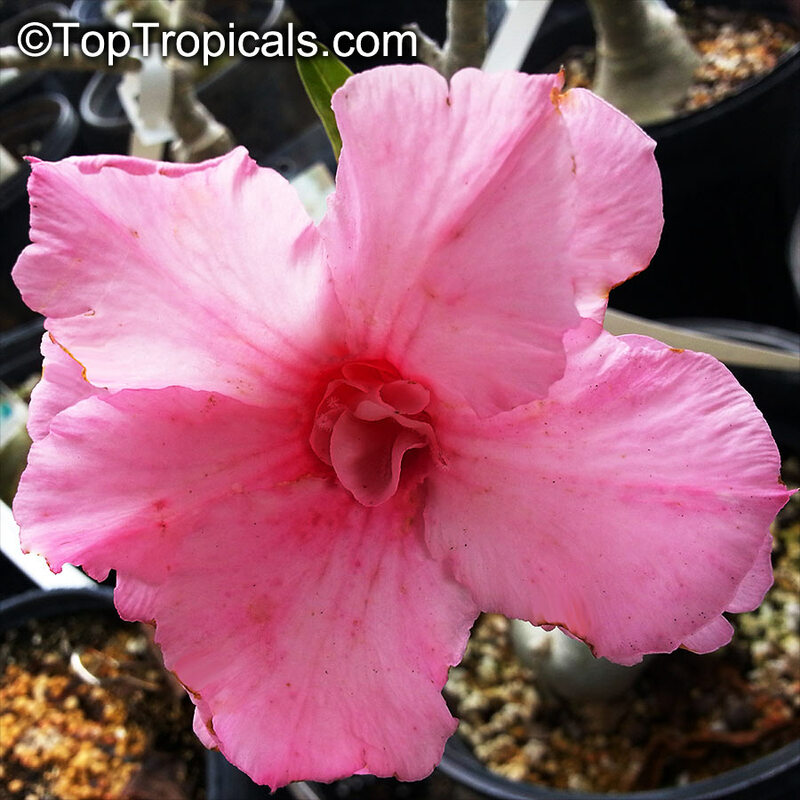 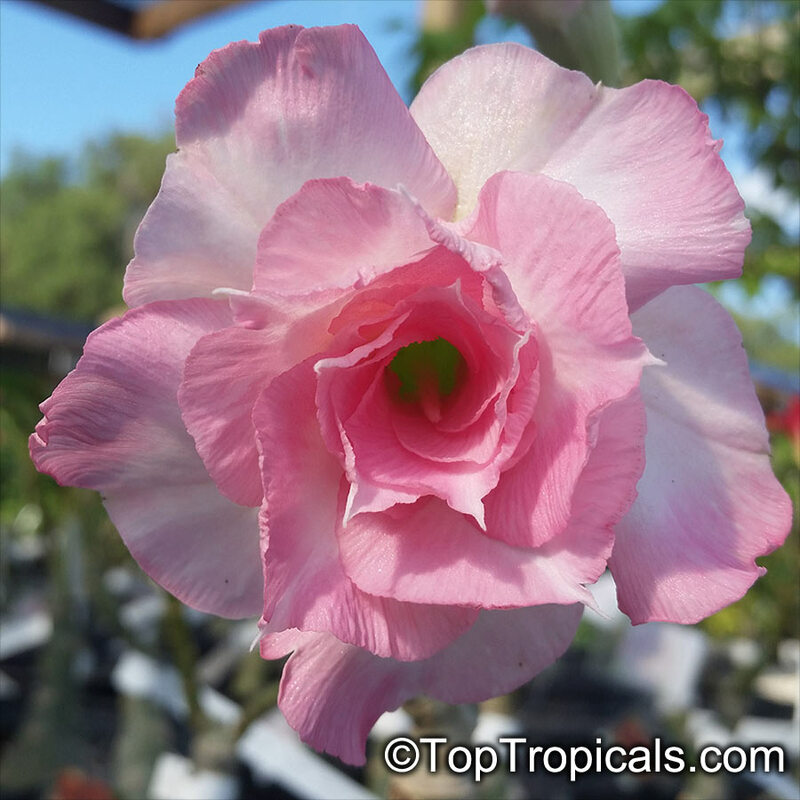 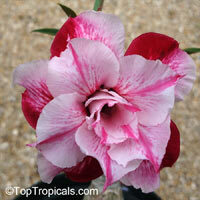 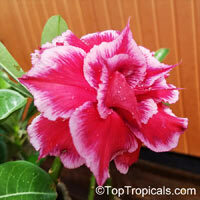 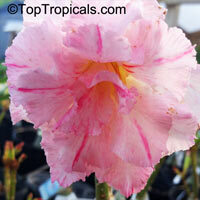 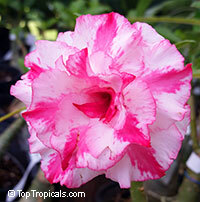 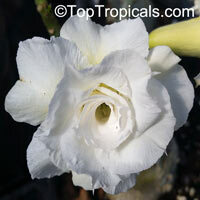 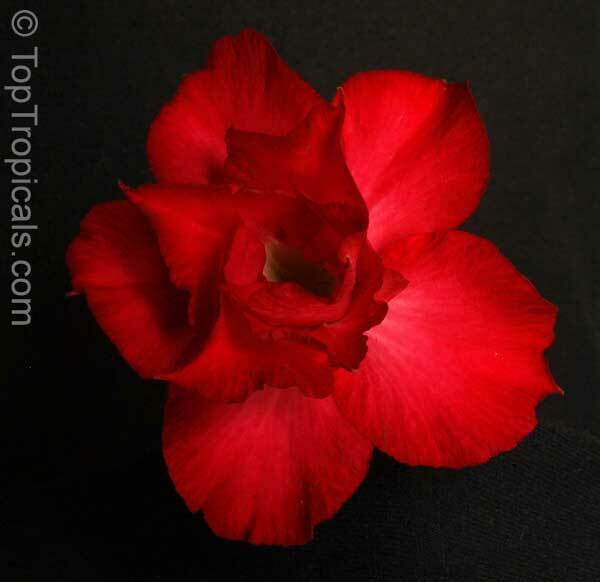 After growing simple pink varieties, it seemed the most exotic flower. 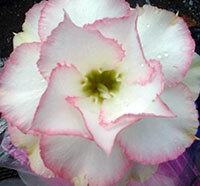 Soon enough other colors were hybridized and white and pink double flowers came to the market. Within just a year or two after that, all the sudden all kinds of colors appeared, including striped, dotted, spotted... 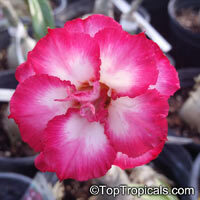 The rainbow of hybrid adeniums nowadays is unbelievable! Adeniums have many spectacular hybrids. The basic culture is very similar to orchids. A small pot with excellent drainage is a must. 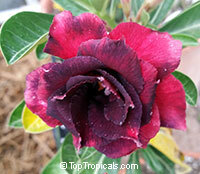 Adeniums do not like both over-watering or drying-out. 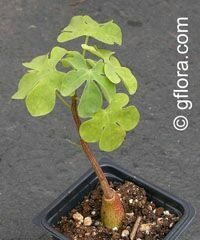 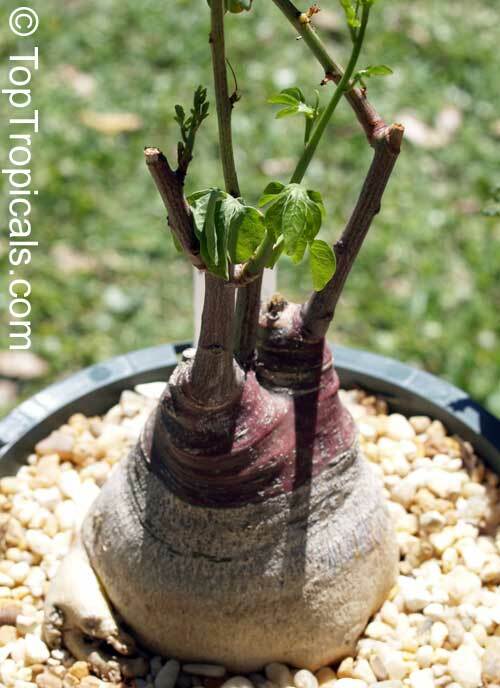 There is a little secret of how to create a weird shape of the base: lift the plant a bit every time you re-pot the plant, so that the upper part of roots will be a little exposed. 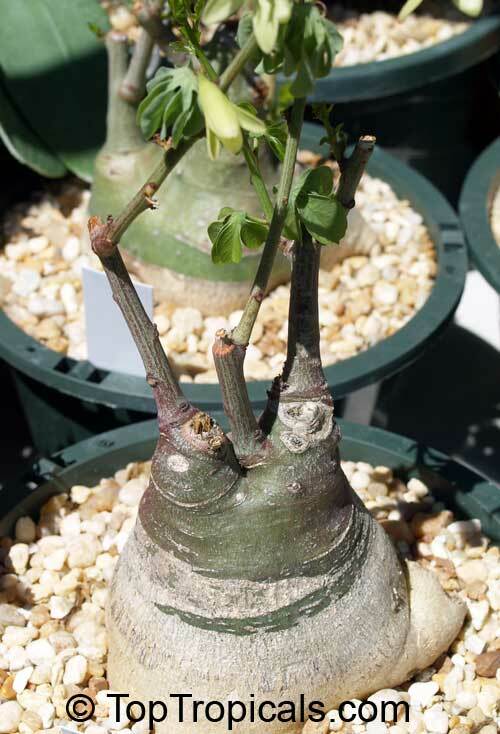 The plant will form more roots that will go down. 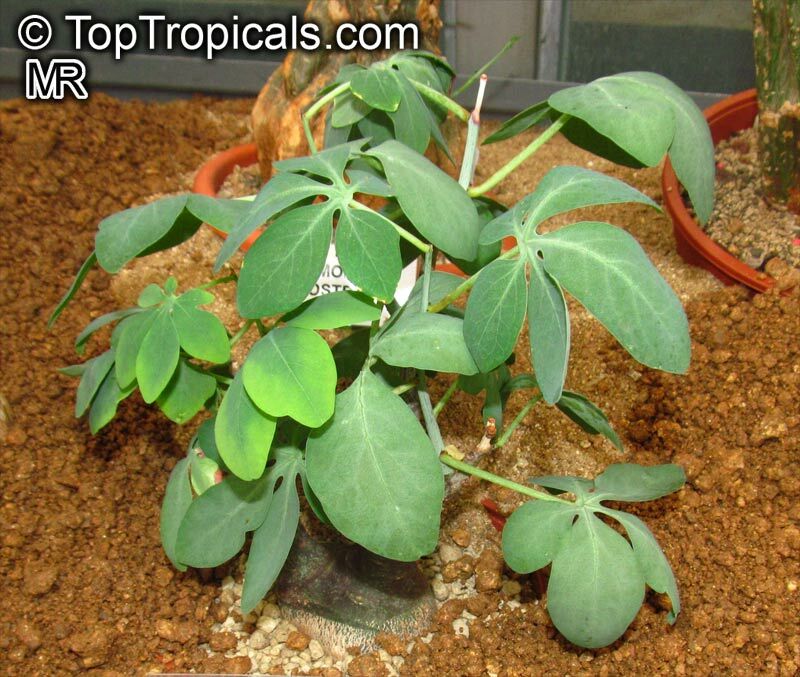 To make your plant develop a large swollen base/trunk, you'll need a good quality fertilizer. 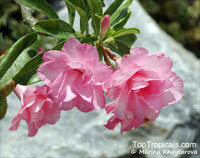 Fertilizer requirement for swelling up trunks is also used to increase flowering. 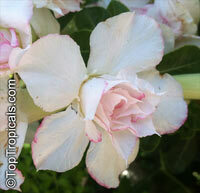 It shouldn't be too high in nitrogen, the middle number should be the highest. Never apply fertilizer directly on roots and do not liquid feed when a plant is thirsty: always water first slightly to avoid root burn and leaf drop. 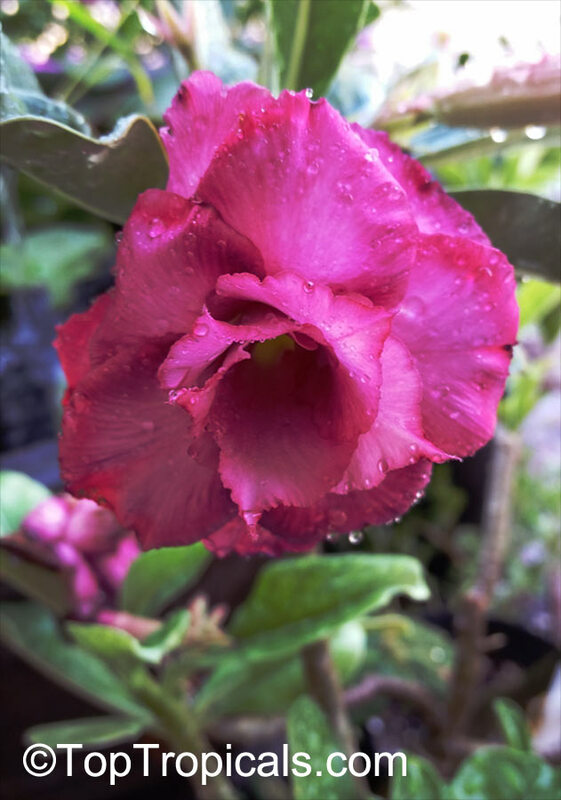 Do not wet leaves. 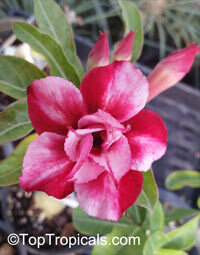 Adeniums need lots of light for heavy flowering. Most hybrids and species start blooming in the spring when the conditions are warm and days get longer, and continue blooming through the fall and winter in warmer climates. 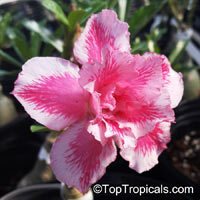 Adeniums like a neutral to hard water. 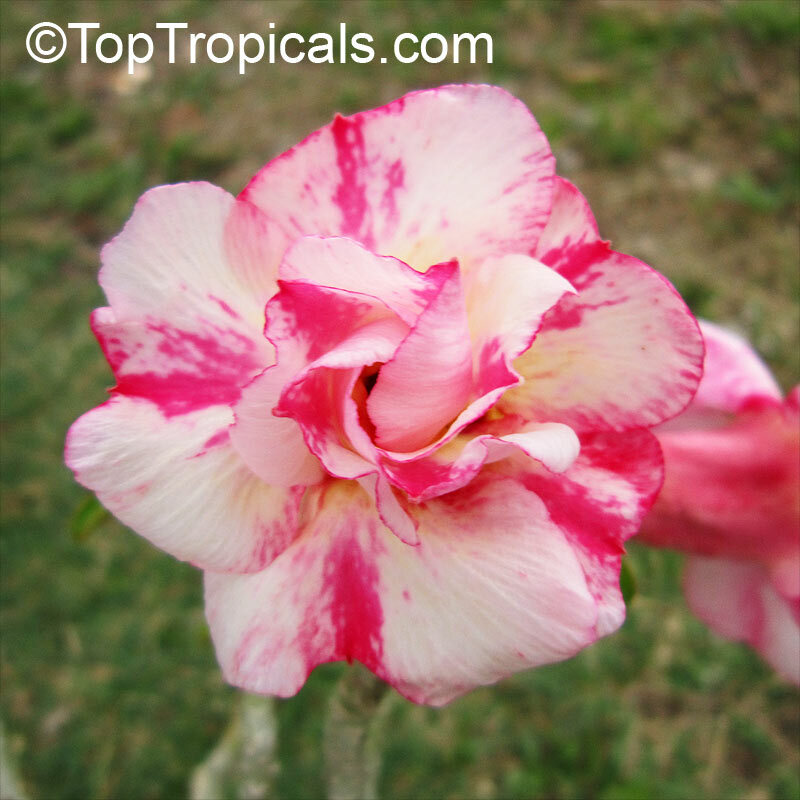 Acidic water tends to sour the soil too fast and may cause root rot. 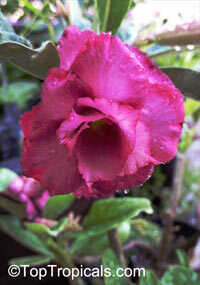 Water plants preferably in the early morning, and allow them to drink up throughout the day. 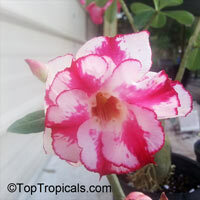 Watering can be done daily to every few days. 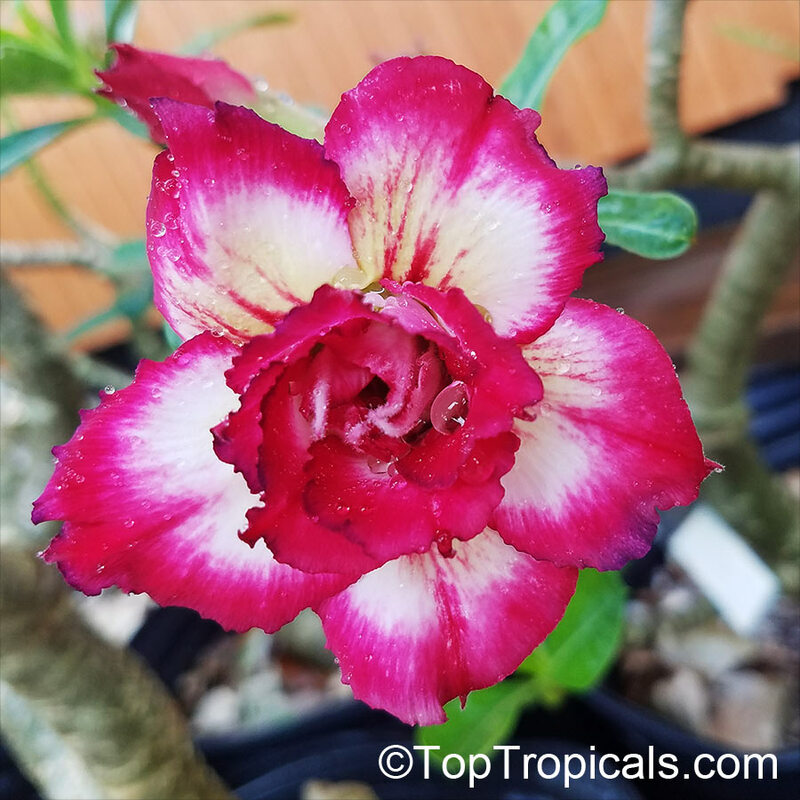 Never allow your plants to sit in a saucer of water, but don't let them to dry out too often - this causes adeniums to go into early dormancy. 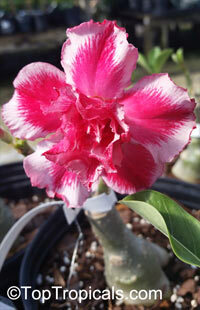 See photo gallery of exotic varieties and Thai Adeniums - milti-colored, multi-grafted. 5822 Adenium Chai Lai, Grafted ? 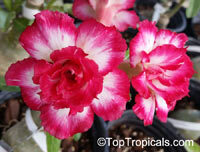 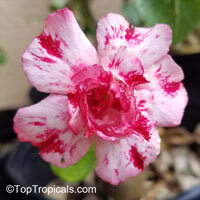 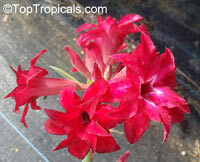 New variety from Thailand with several layers of red-and-white petals. 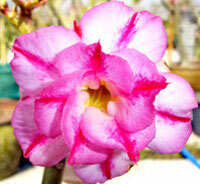 4974 Adenium Cham Fah, Grafted ? 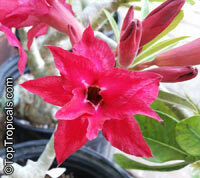 4699 Adenium Chandra, Grafted ? Very light pink with darker pink edge, spectacular! 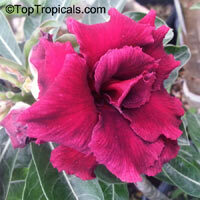 6246 Adenium Chocolate, Grafted ? 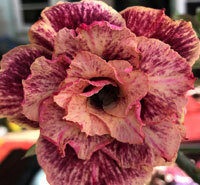 New showy variety with multi-layered tripple flowers of mauve color with peach stripes. 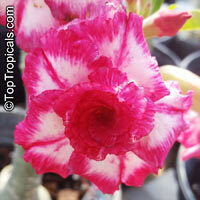 5821 Adenium Chok Am Nuay, Grafted ? 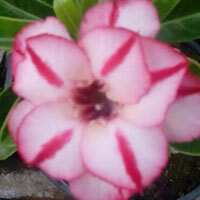 4975 Adenium Chot Rassamee, Grafted ? 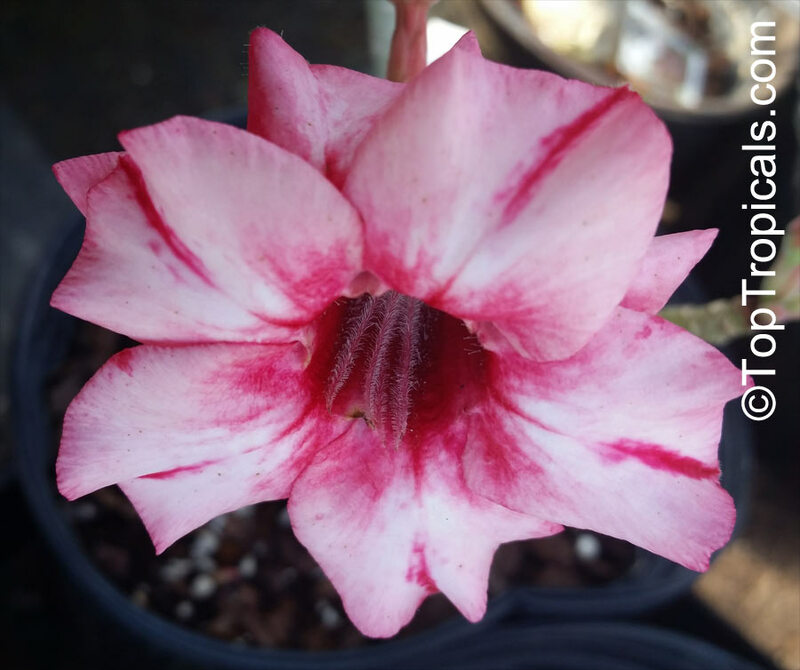 4675 Adenium Classic, Grafted ? 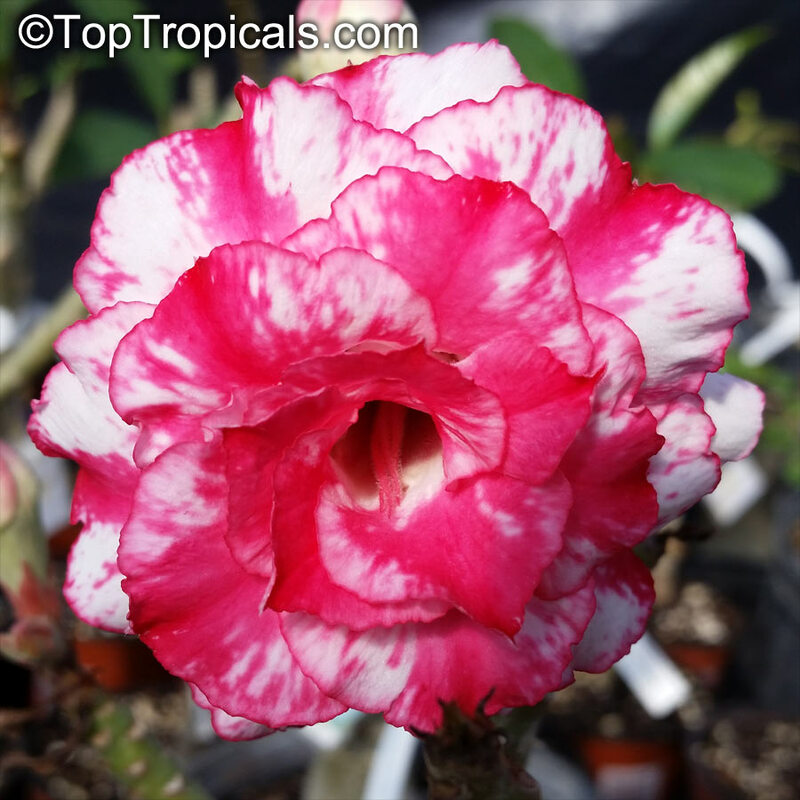 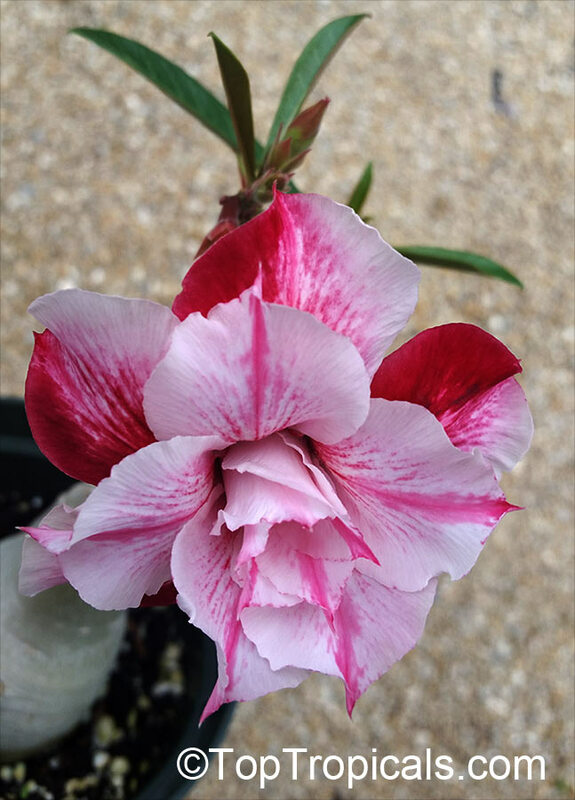 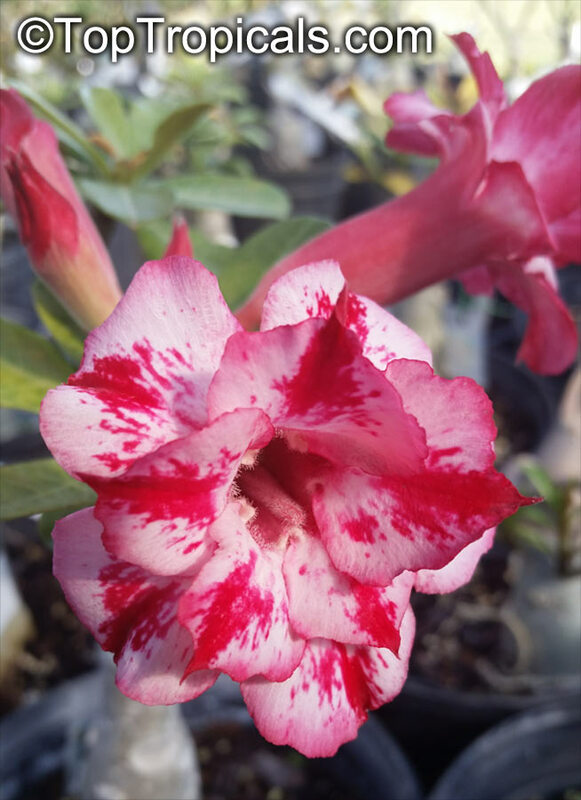 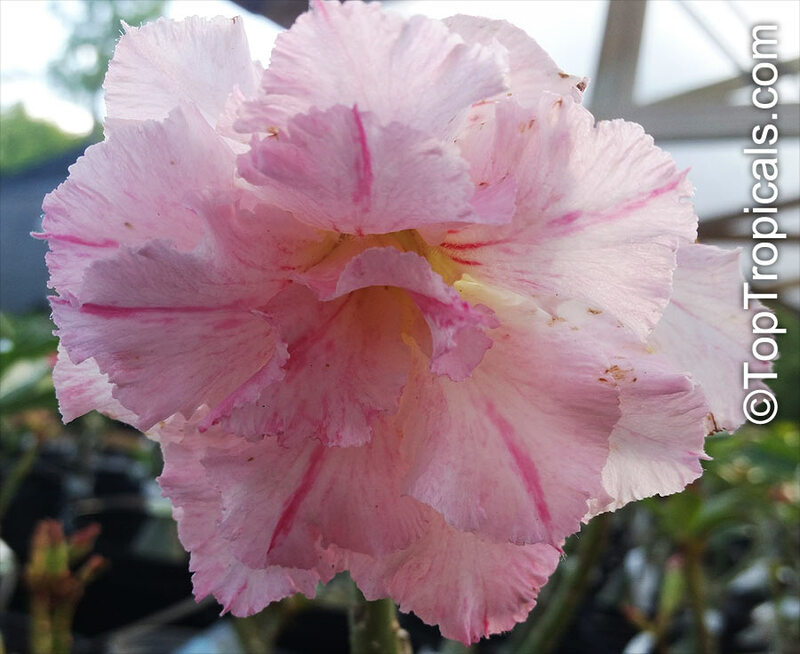 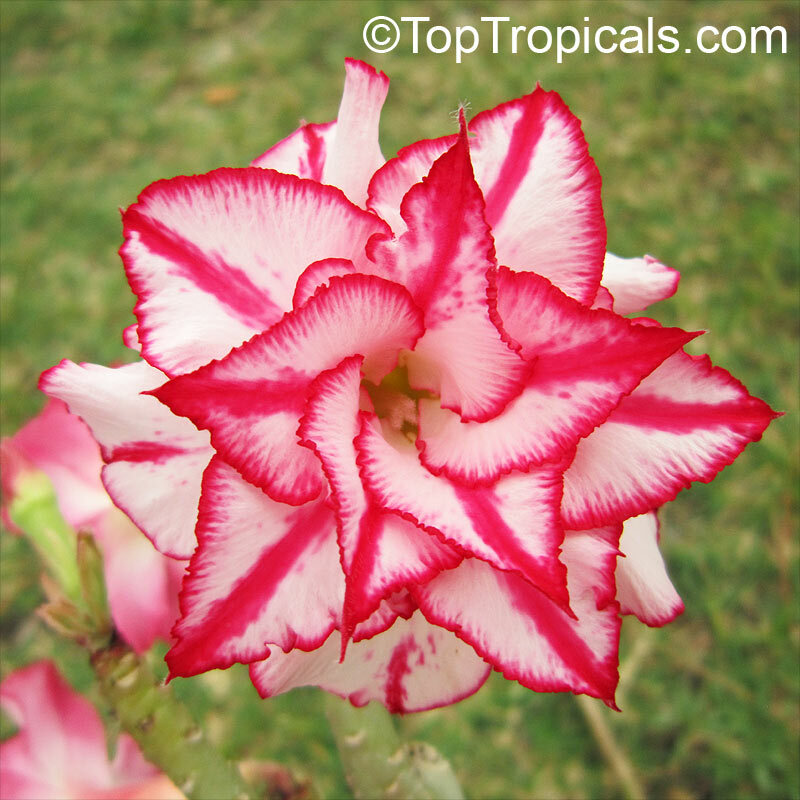 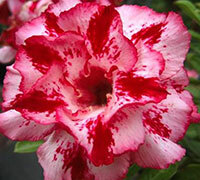 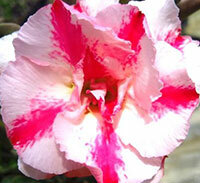 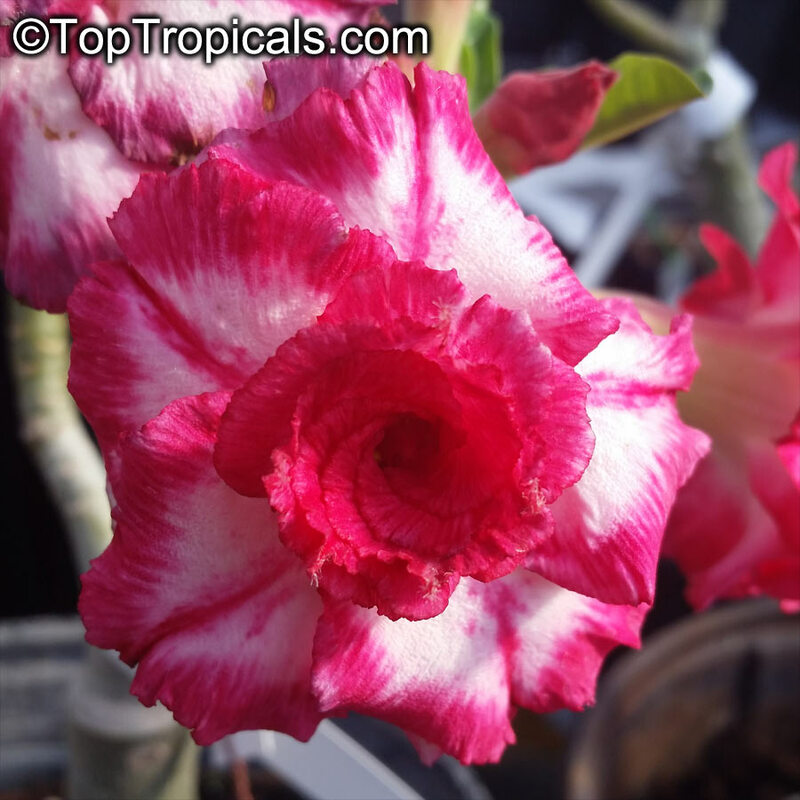 Exotic color of Desert Rose, one of the most beautiful color varieties - triple pink flower with red stripes. 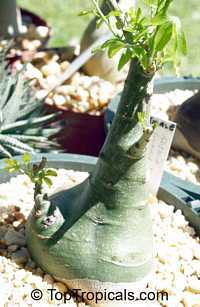 The plant is with caudex, blooming size. See picture of size of caudex. 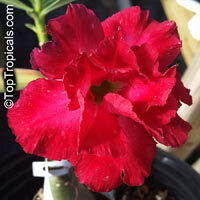 6110 Adenium Dang Bailey, Grafted ? New variety from Thailand, with a flower looking like exotic rose! 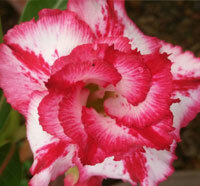 Double flower, dark blood red with white swirl and stripes like arrows. 5985 Adenium Dang Sab Mongkol, Grafted ? 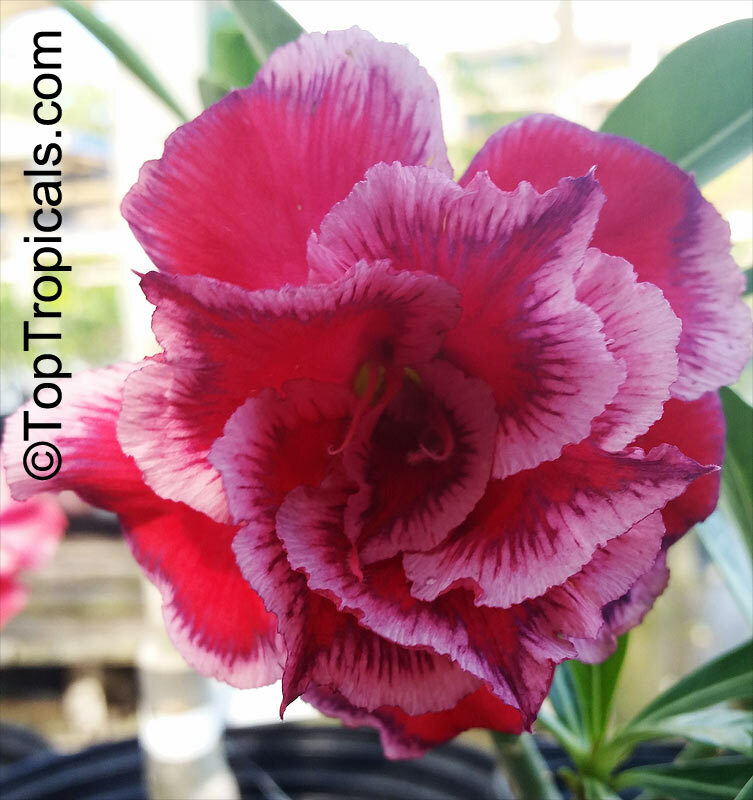 New variety from Thailand. 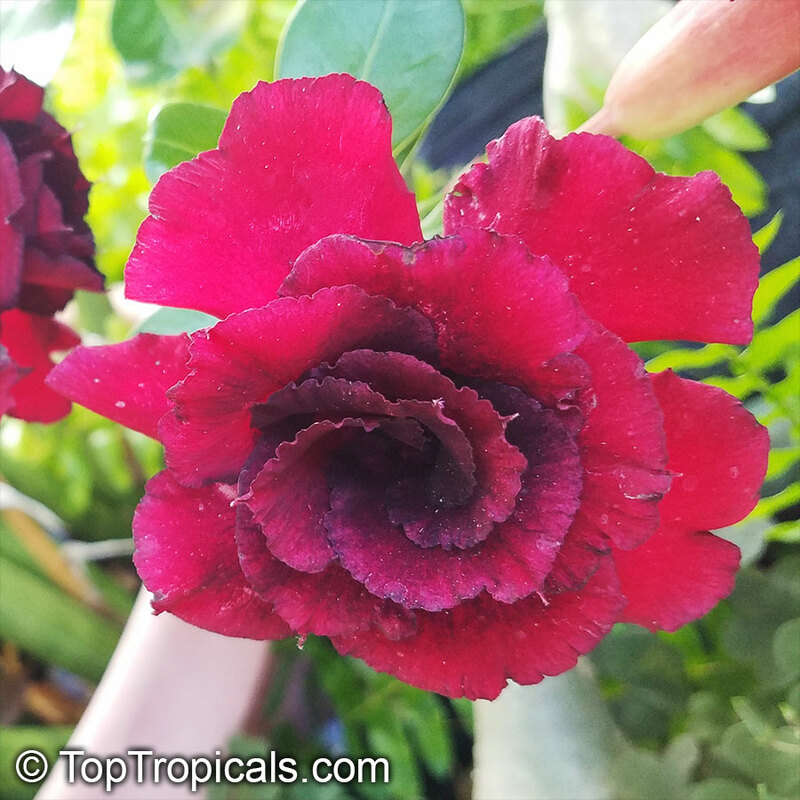 Multi-layered, intense red flower with delicate black edge. 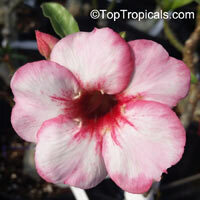 4646 Adenium Double Celona, Grafted ? Double flower variety of Celona adenium. 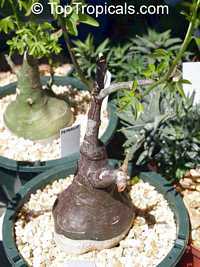 The plant is with caudex, blooming size. 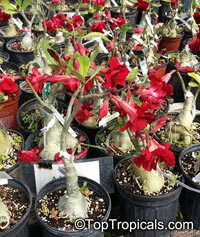 4978 Adenium Double Pettunear, Grafted ? 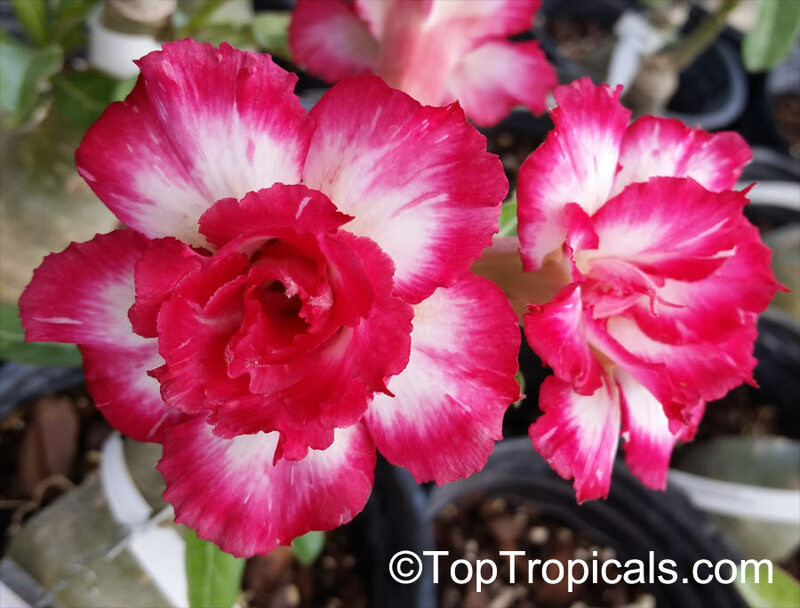 New variety from Thailand. 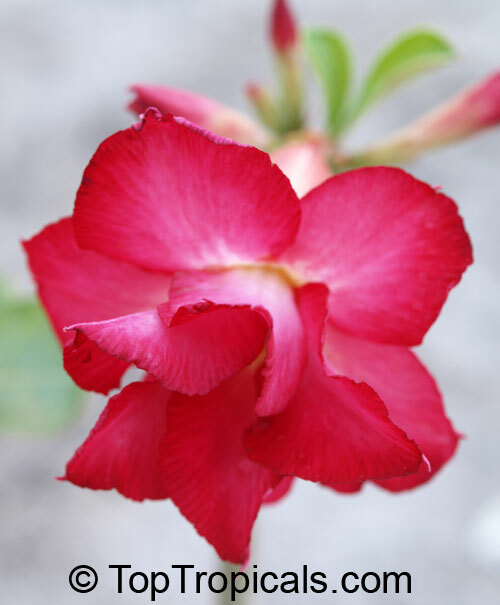 Picture coming soon! 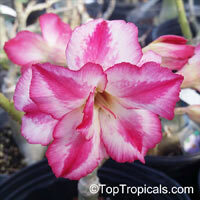 5987 Adenium Double Polcedon, Grafted ? 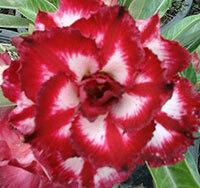 Bright contrasting double flower with white center and crimson border. 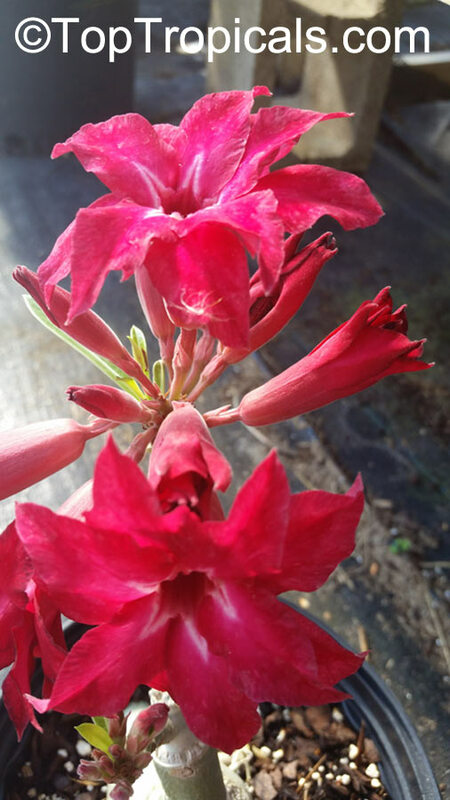 Flowers shine like lights! 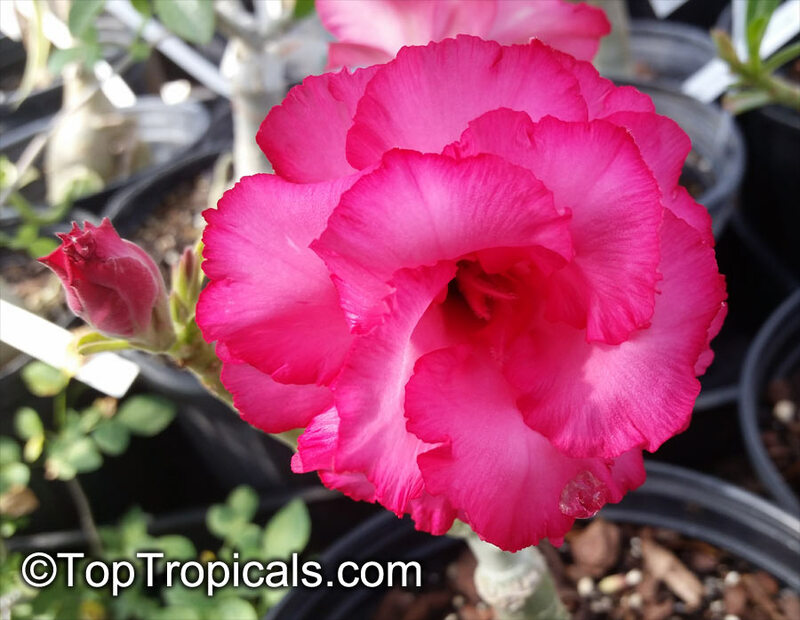 4561 Adenium Double Waterfall, Grafted ? 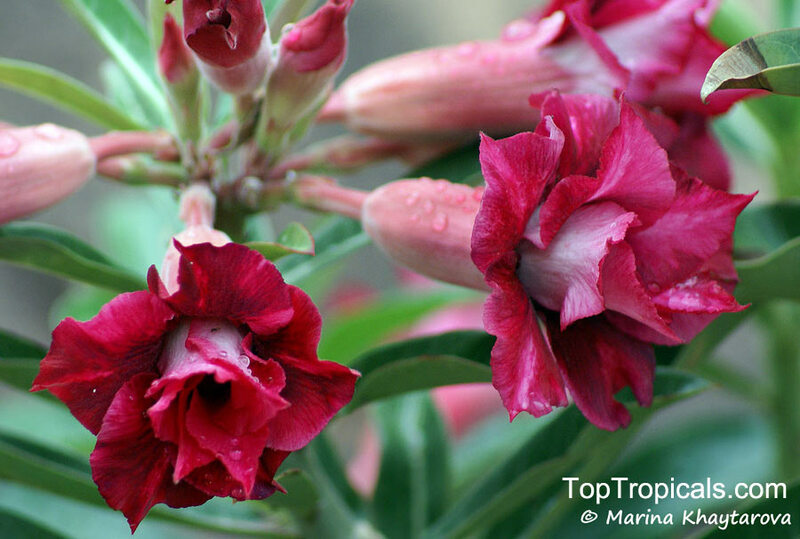 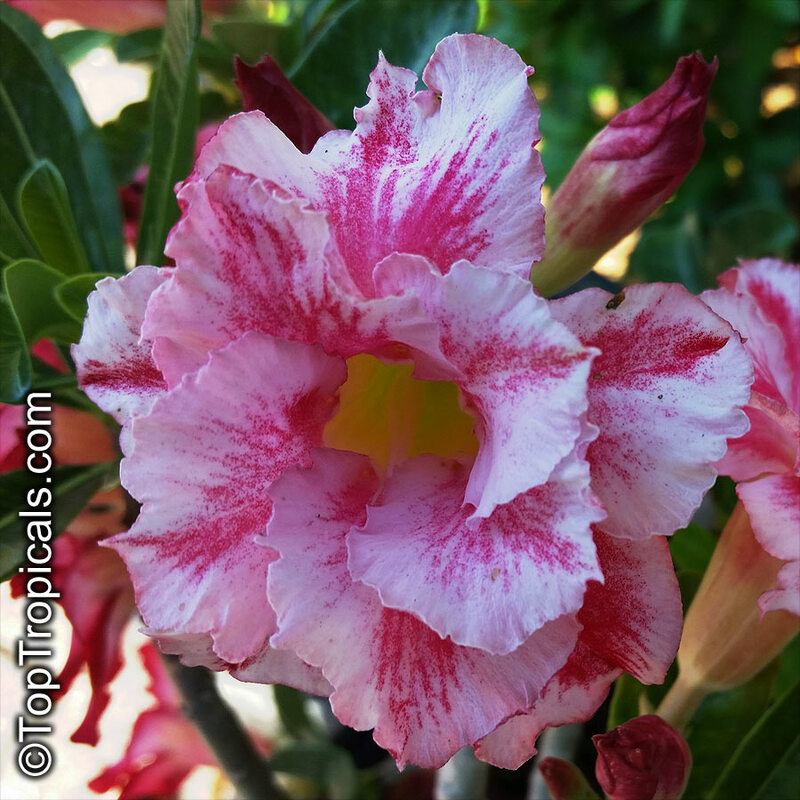 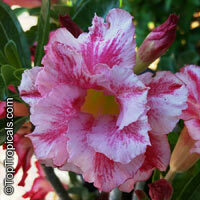 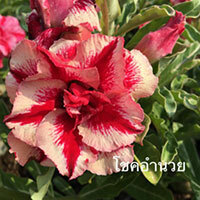 Exotic color of Desert Rose from Thailand. 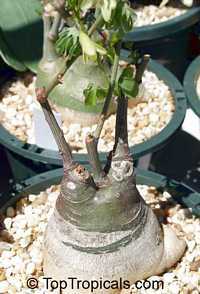 The plant is with caudex, blooming size. 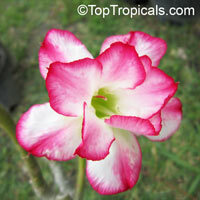 5989 Adenium Fairy Rose, Grafted ? 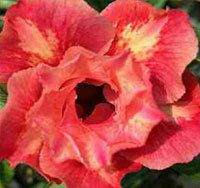 Interesting new intrduction from Thailand, peachy-reddish double flowers, with splashes of yellow and orange. Very tropical looking flower! 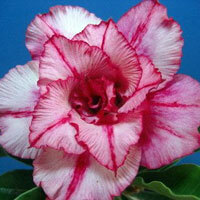 2535 Adenium Fancy Double Multi-Grafted ? 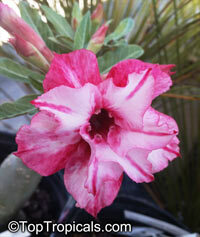 Desert Rose - with large caudex, blooming size. Multicolored grafted varieties (2-3 colors on same plant, some varieties are double flower). 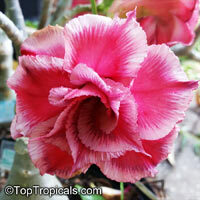 5467 Adenium Fighting Fishtail, Grafted ? 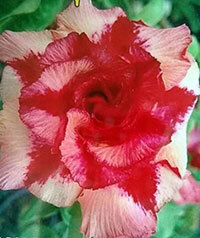 Fighting Fishtail. 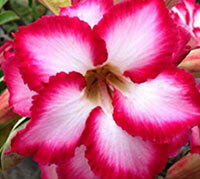 New variety from Thailand. 5990 Adenium Firing Angel, Grafted ? 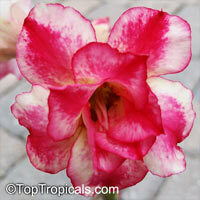 This variety looks different - it has outer layers of petals lighter than internal petals. 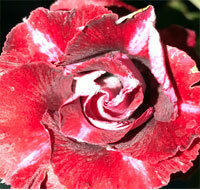 Center is bright red, outer petals white with some red frosting.